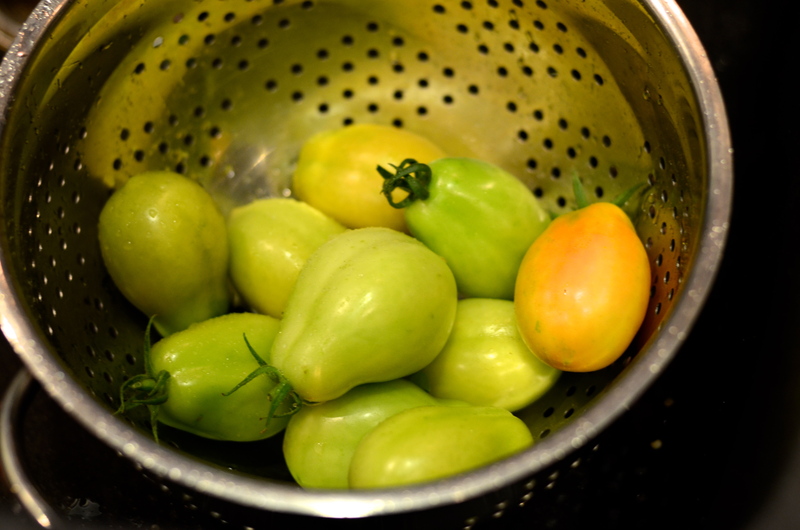 I knew the day would come when I would have plenty of tomatoes. If I was ever worried about not getting my fill of ripe tomatoes this summer, my cherry tomato plants have been sure to put me at ease. I can’t complain about the steady output from the two plants. In fact, I am particularly pleased that the plump orbs keep well on the counter, several days after being picked. They are easy to share with friends and family, and they just keep coming. 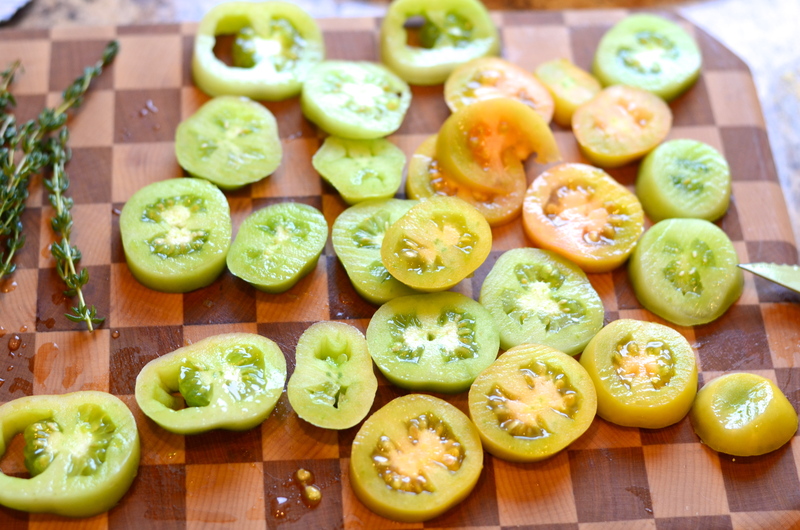 Fresh cherry or grape tomatoes are wonderful for snacking, but I do love me a cooked tomato, warm and burst open at the seams. Don’t you? 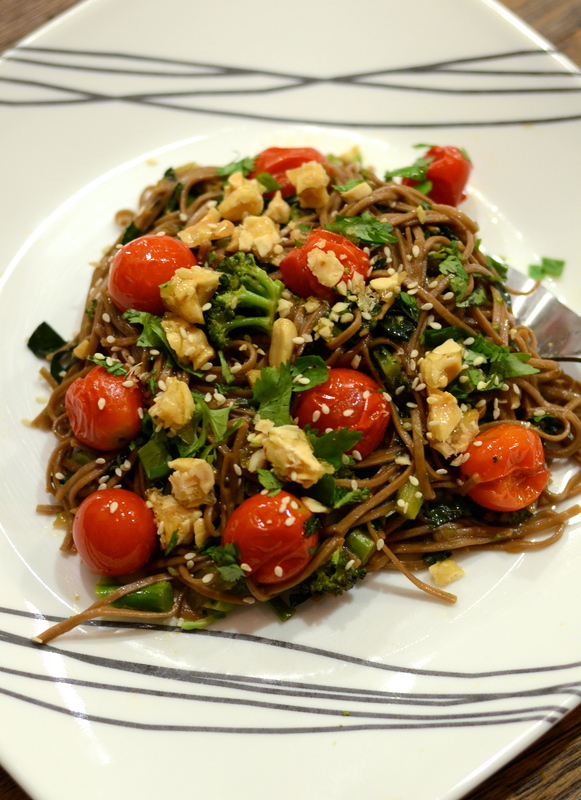 Roasted cherry tomatoes serve as the topping for this delicious soba noodle dish, a recipe I picked from Blue Apron. I only used the Blue Apron delivery service once so far, but I’m on the mailing list, and I saw this recipe in July. 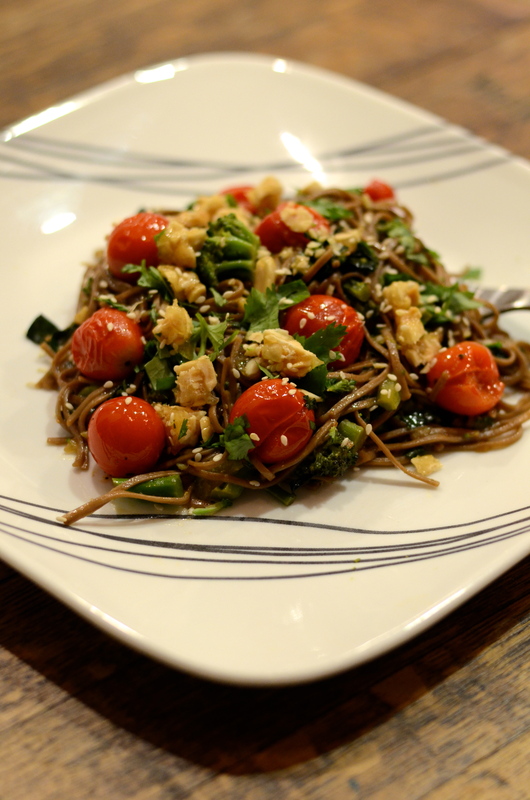 It seemed unusual to use tomatoes in a Japanese-inspired preparation. It intrigued me. Fortunately, my red miso stood ready (in place of the original recipe’s “hatcho miso”). 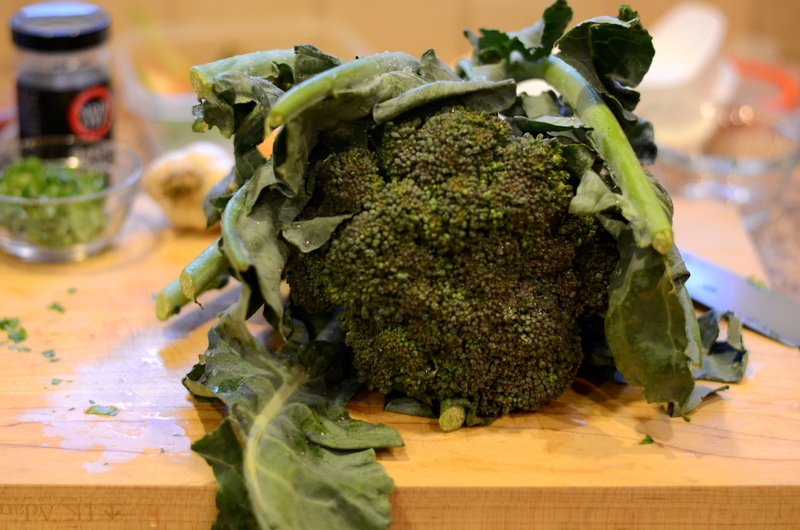 In addition, I happen to have allowed myself to supplement my stock of CSA vegetables with the purchase a beautiful, leafy head of broccoli from a farm stand on my way home from a North Fork winery event over the weekend. A portion of this broccoli took the place of what would have been Chinese broccoli. 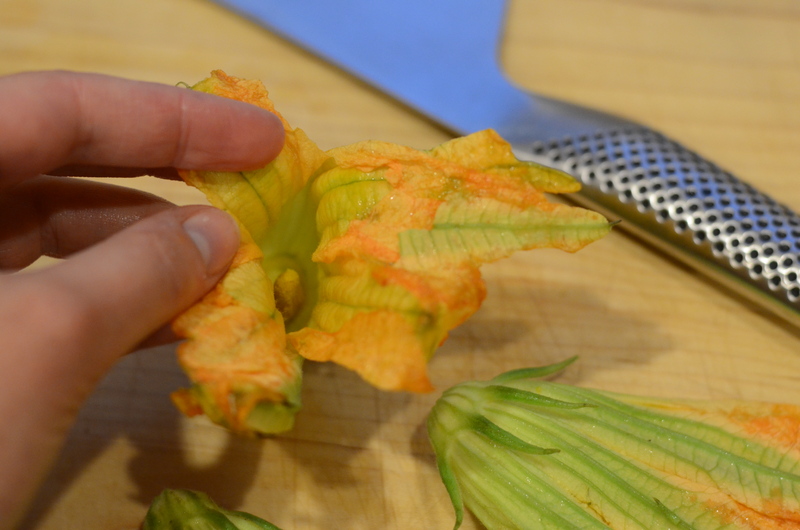 I even used some of the stems, peeled to remove the tough outer portion, and chopped. I keep reading that broccoli stems can be delicious, and I shudder to think of the dozens of giant broccoli stalks I’ve sent to the garbage in my day! Even with a few modifications, the meal came out great. I wished I had made twice as much. It’s definitely a keeper! 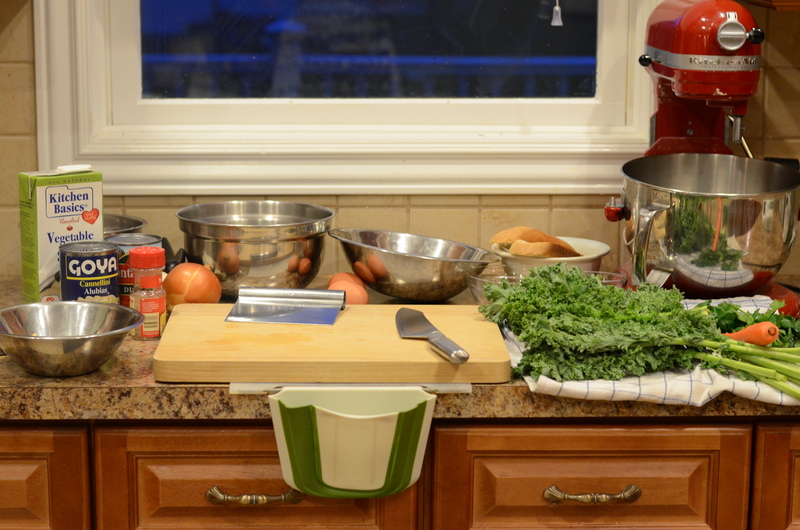 Wash the produce, chop, and set aside. The ginger root should be peeled and minced. 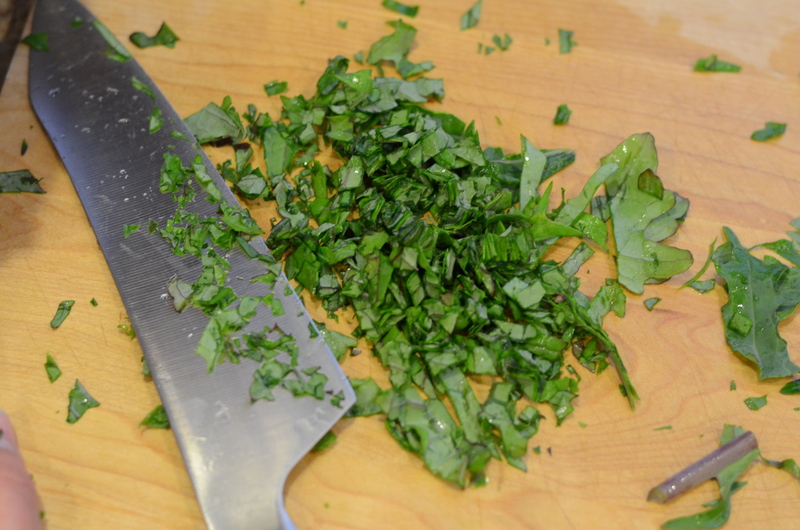 The cilantro leaves can be picked from the stems, roughly chopped, and set in a bowl. Half will be added in the cooking process, and half will be saved for garnish. 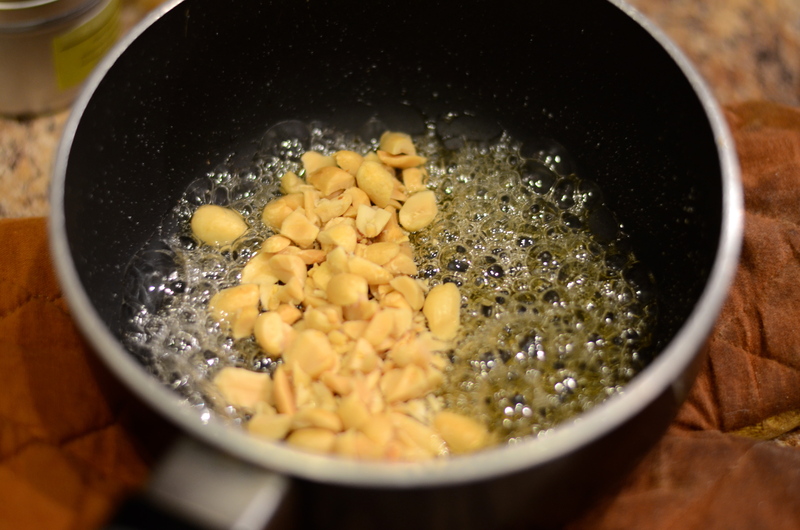 Another topping will be candied chopped peanuts (cashews are preferred, if you have them). 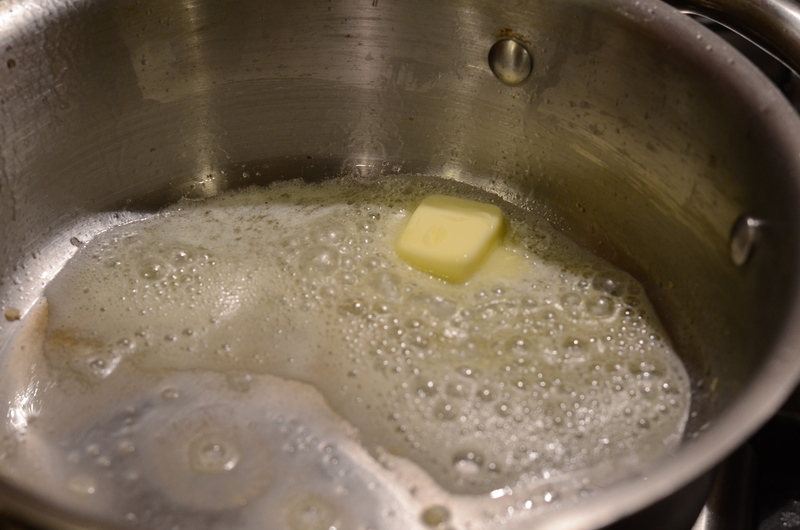 To prepare, set a small pot with the sugar and 1/4 Cup of water over medium-high heat. 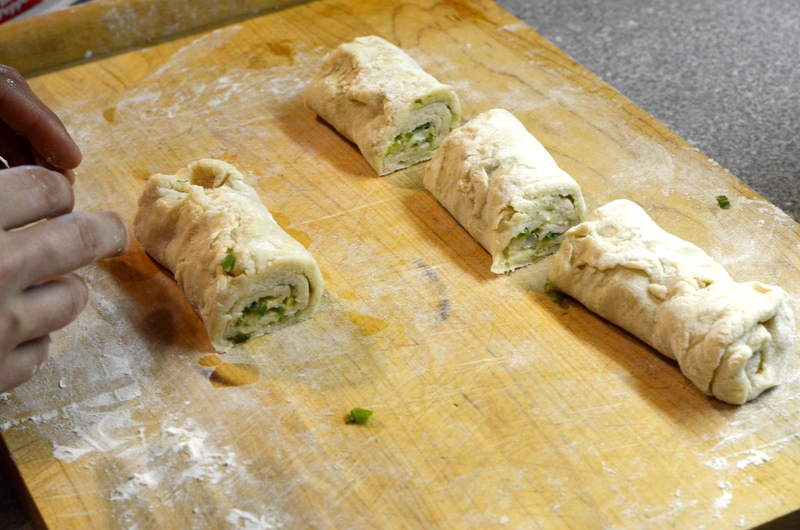 Also prepare a small pan lined with a little bit of parchment paper. Allow the water-sugar mixture to boil, without stirring, for several minutes, until the color starts to change into a golden blonde. 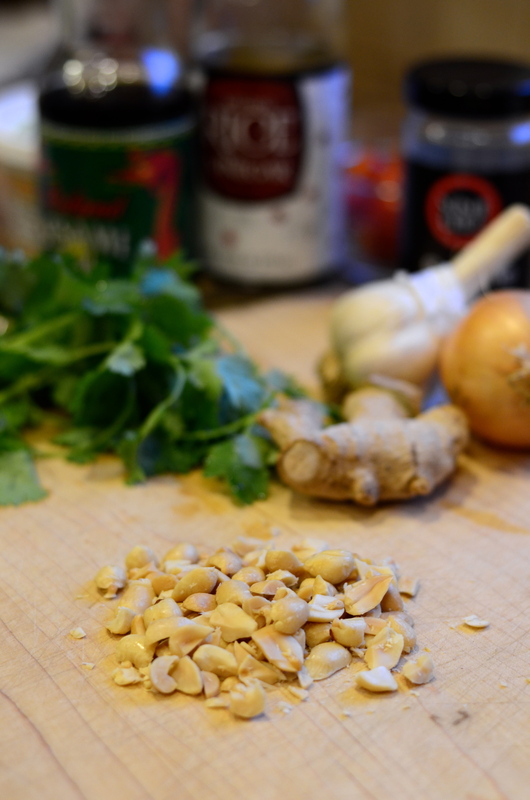 Remove from heat and stir in the chopped peanuts. Then pour the mixture onto the parchment paper. Spread evenly and allow to cool. Here’s where it gets exciting (for the person washing dishes)! 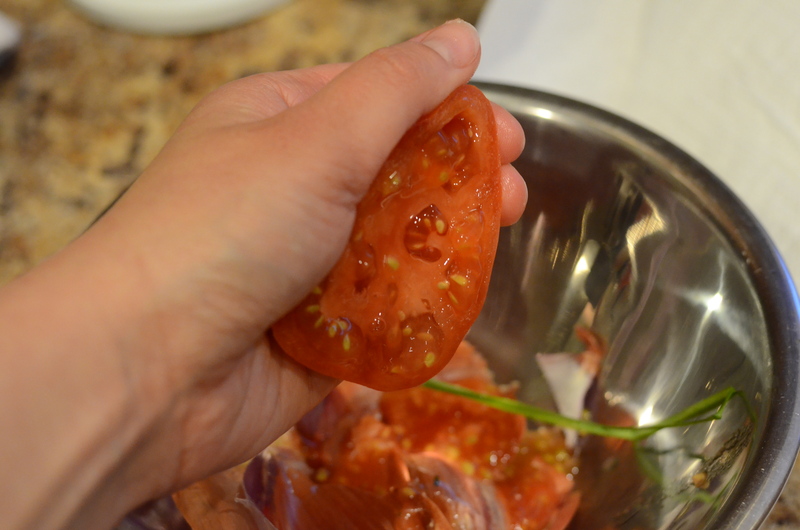 For the tomatoes, preheat the oven to 450°F. 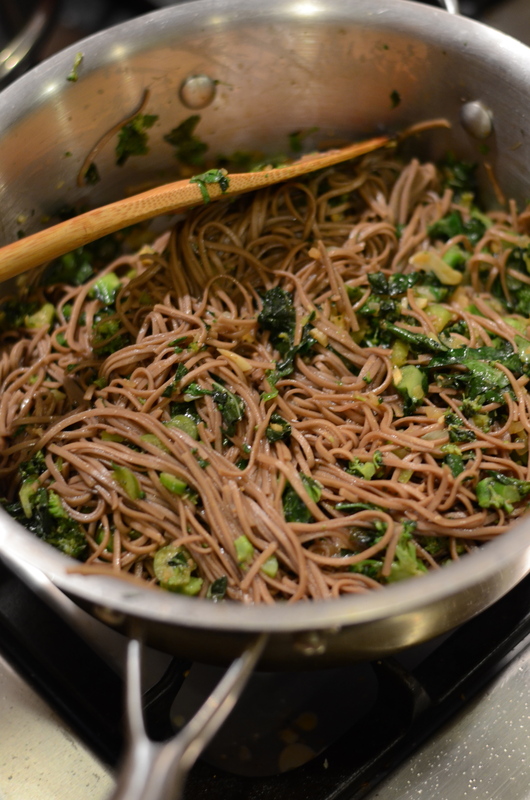 For the soba noodles, fill a medium pot with water and set over heat to boil. 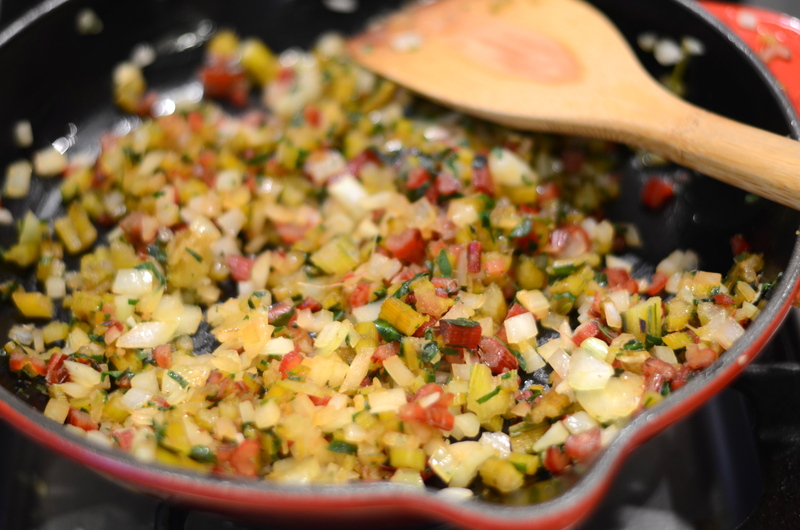 Grab a large sauté pan for the vegetables. 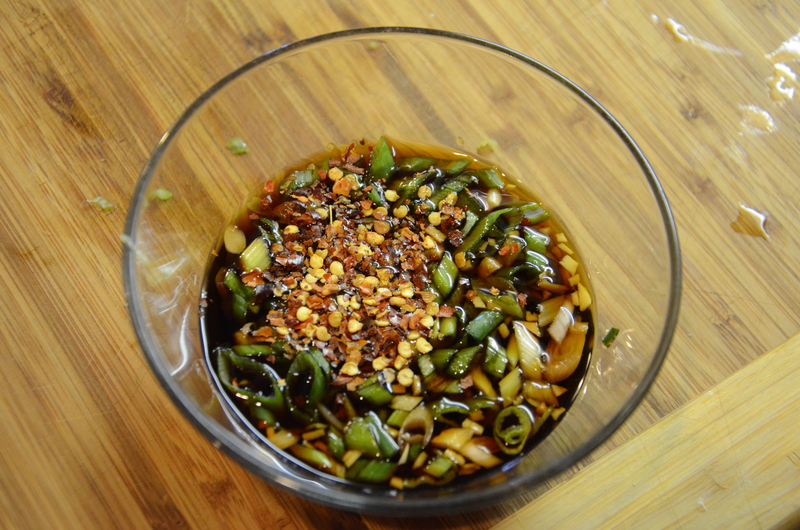 In a small bowl, whisk together the miso paste, rice wine vinegar, sesame oil and ½ Cup of water, until smooth. 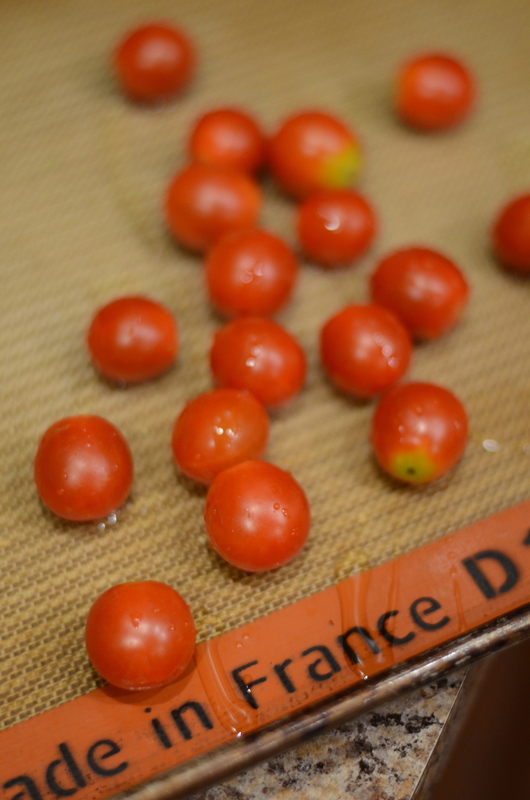 On a sheet plan, spread the cherry tomatoes and drizzle with olive oil. Season with salt and pepper and toss to coat. Roast 6 to 8 minutes, or until softened and lightly browned. Remove from the oven and keep warm. 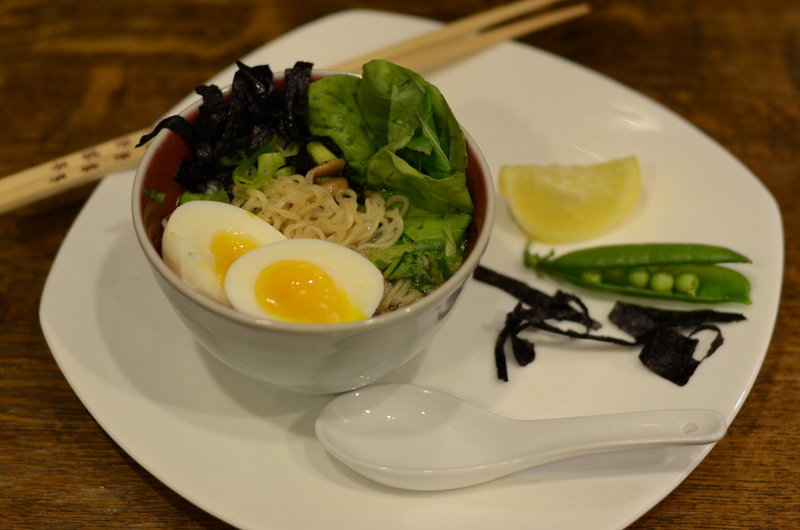 Meanwhile, cook the soba noodles briefly in the boiling water, 1 to 2 minutes. The noodles will remain somewhat firm. 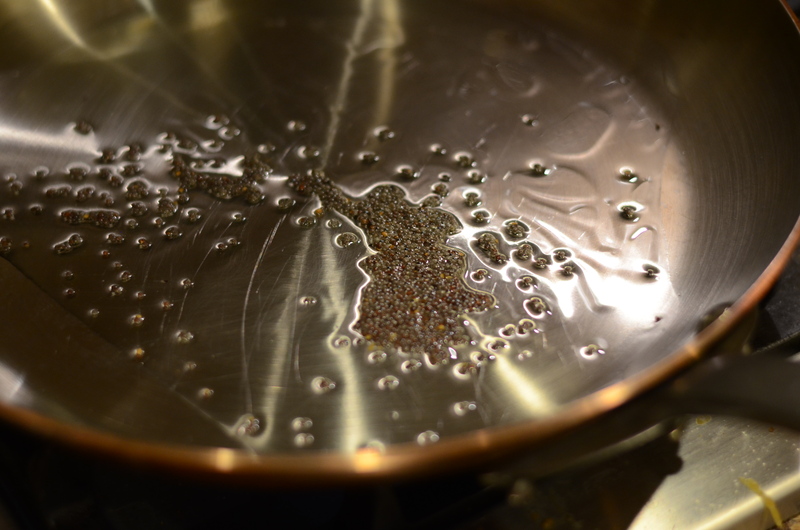 Drain and return to pan with a little bit of warm water to prevent sticking. 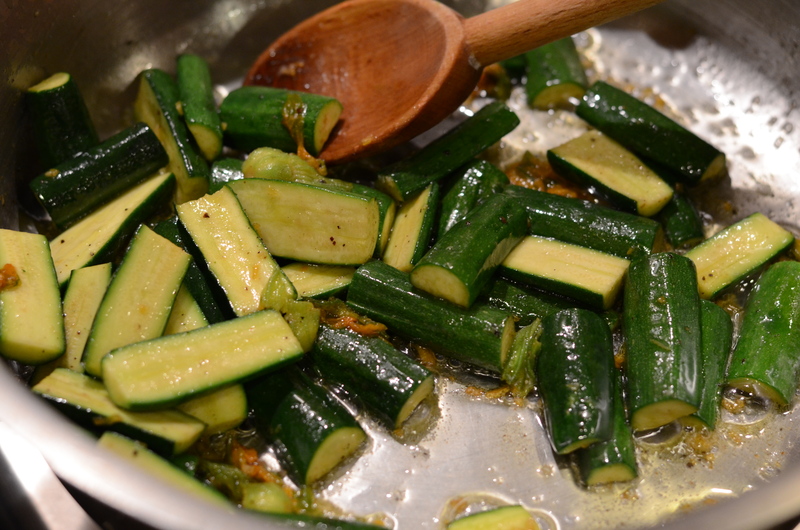 In the vegetable pan, heat 2 teaspoons of olive oil. 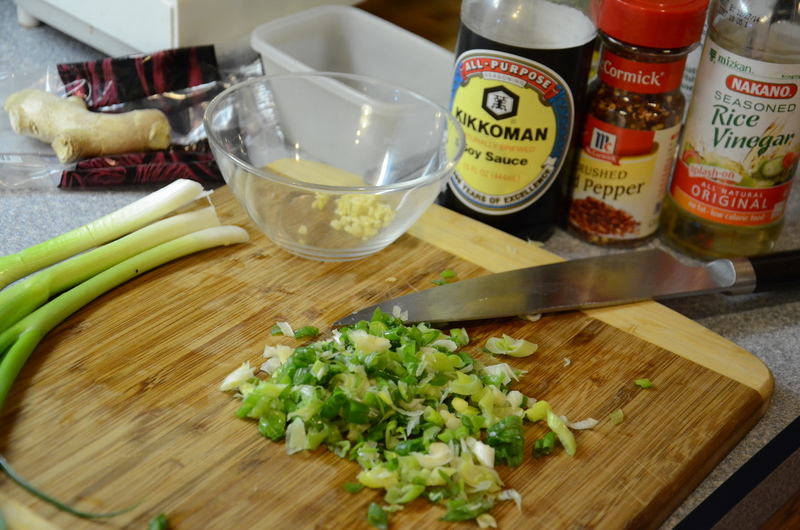 Add the ginger, onion, and white part of scallions. 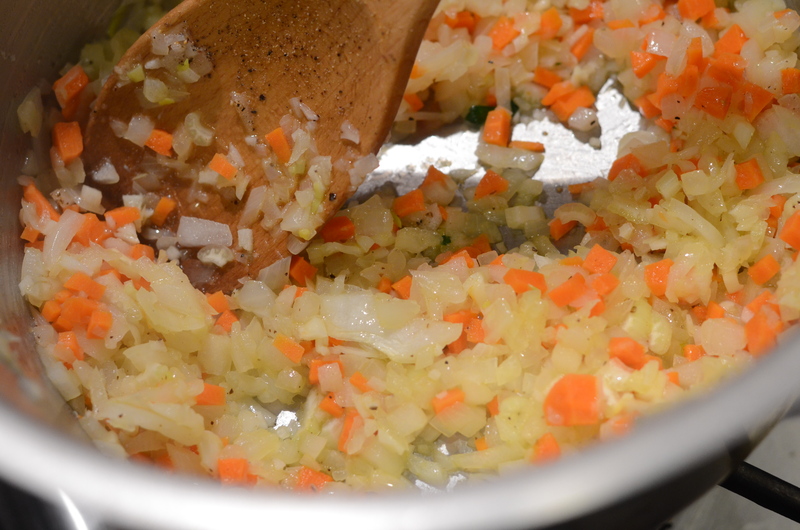 Sauté gently until they begin to soften. Add the broccoli and cook for several minutes until it becomes slightly tender. 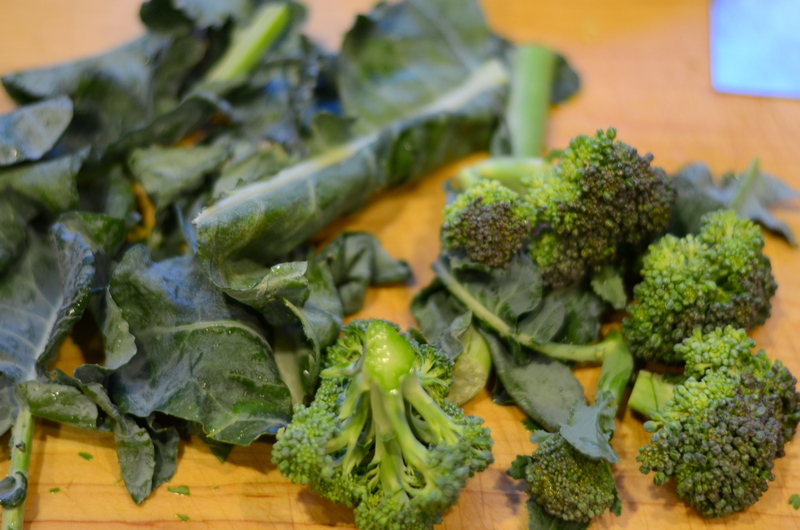 It’s likely that the broccoli stem portions will remain slightly crunchy, unless you pre-cook them, but they will add some nice additional texture. 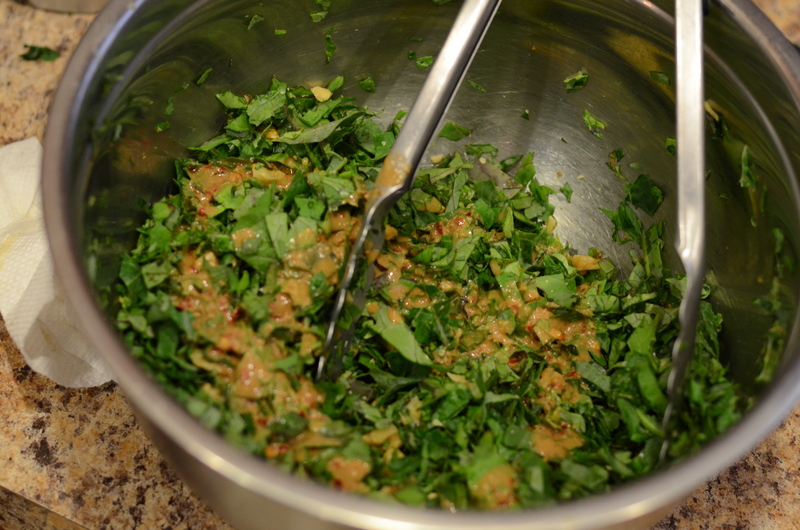 Pour in the miso mixture, the cooked soba noodles, half of the cilantro, and the green parts of the scallions. Cook for a few minutes, at which point most of the liquid will be absorbed. Remove from heat and taste for additional salt and pepper. 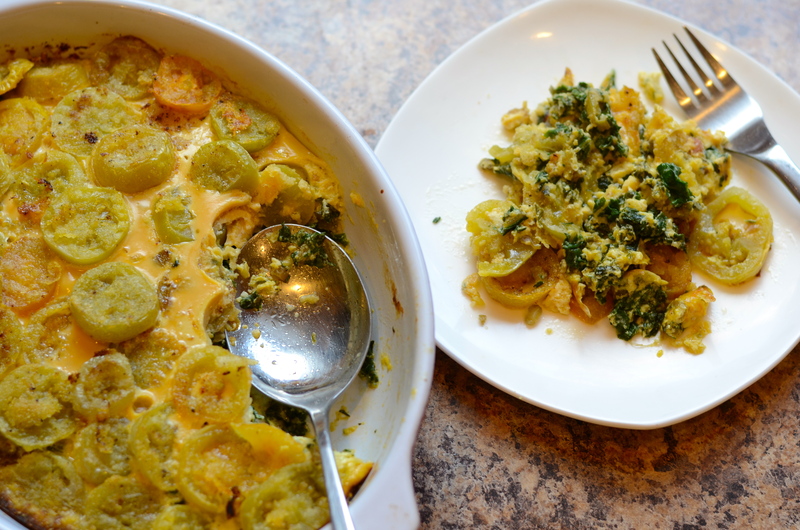 Isn’t it ironic that the most delicious, comforting foods can look ugly in photographs. 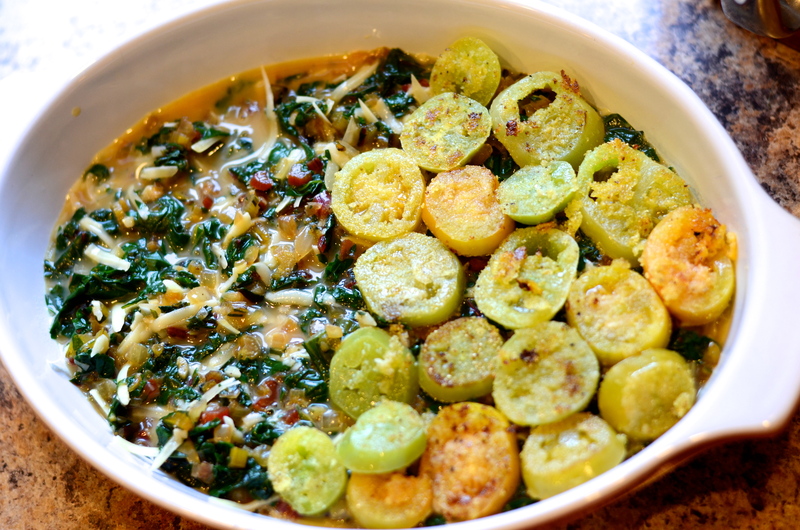 while cold, bland dishes appear stunning? (I checked to make sure that I am using the word “ironic” correctly, especially after watching Weird Al’s music video this week). We live in a world where it can’t be true that you ate good food unless you got a good picture. 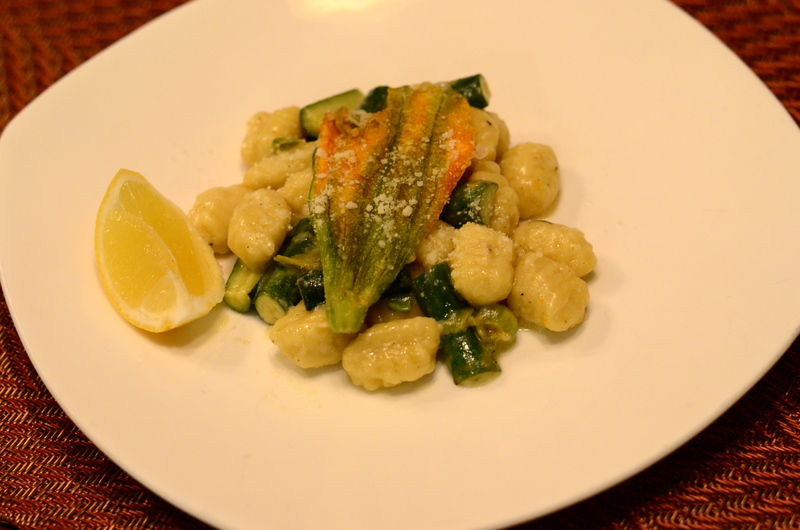 I can be reluctant to post certain recipes on this blog because they look unimpressive in my pictures. I’m not going to dwell on these facts, because today I have a recipe for you that is delicious for the eyes and the mouth. Hooray! 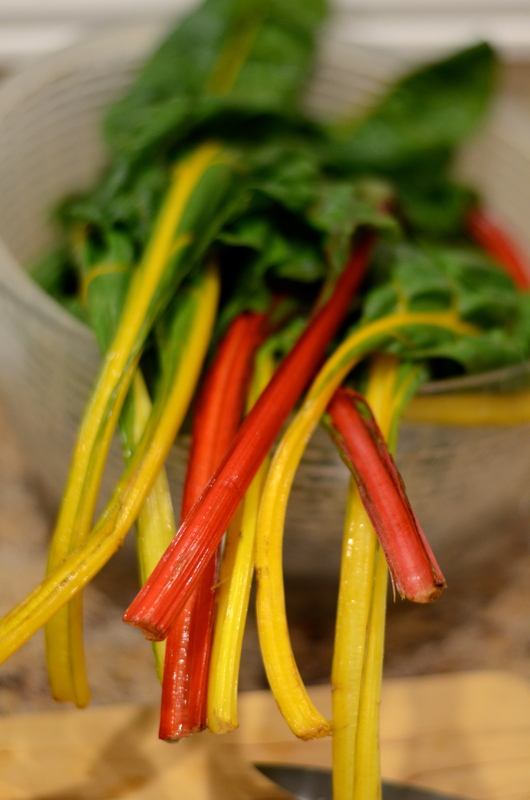 When you receive something as visually lively as red and white candy cane beets in your farm share, you have to show them off. 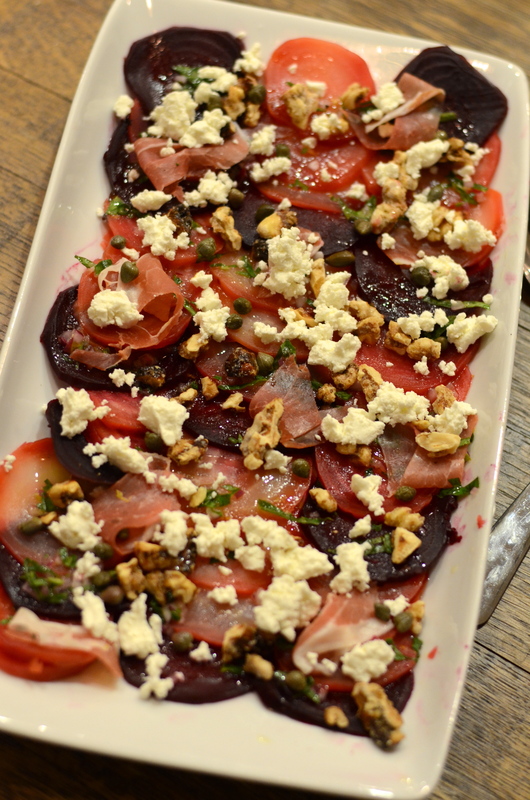 If you have one red beet leftover from the previous week, even better! 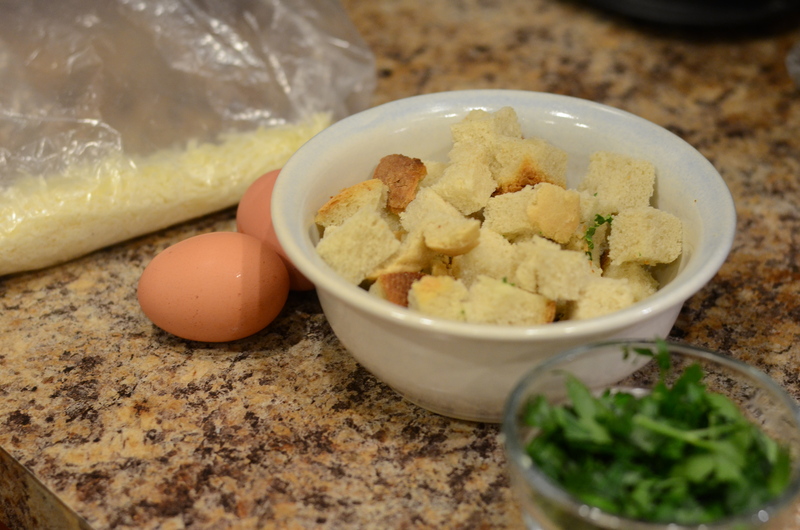 Throw in some salt, some sugar, and some fresh herbs, and some creamy and crunchy texture, and you have a delightful dish. 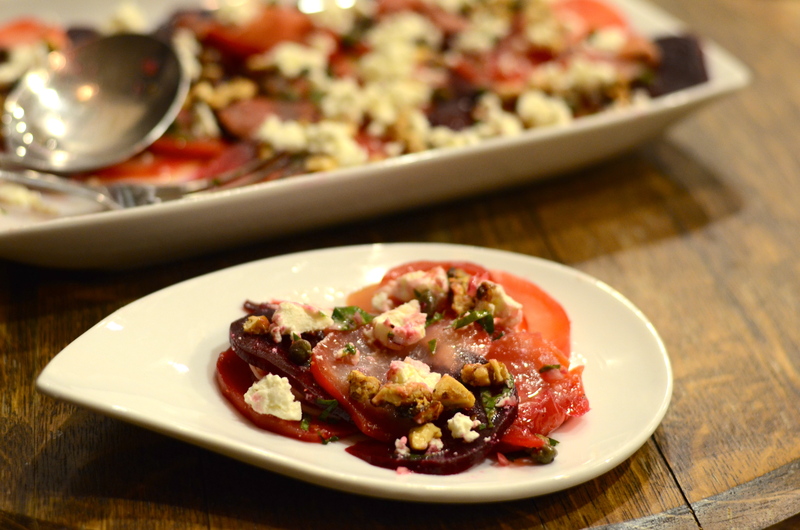 You can roast the beets and glaze the walnuts for this recipe the day or even days before, which eases the pressure of completing it for dinner guests. Burnt edges but still edible! 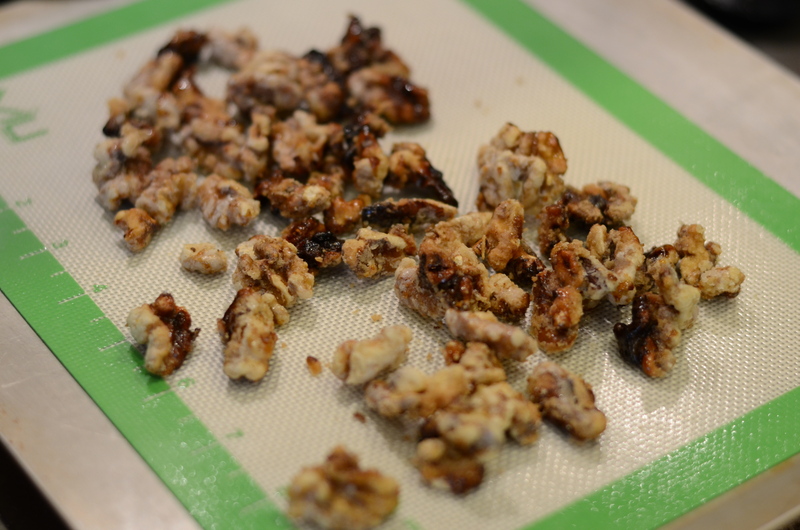 I thought I would take a shortcut and use a microwave method for combining the sugar and walnuts. Not a good idea–even at 2 minute intervals, they started burning and sticking before they were supposed to be done. As a result, I don’t advise following this recipe. Anyway, I used 1 Cup walnut halves and 1/3 Cup sugar plus 2 Tablespoons of water. 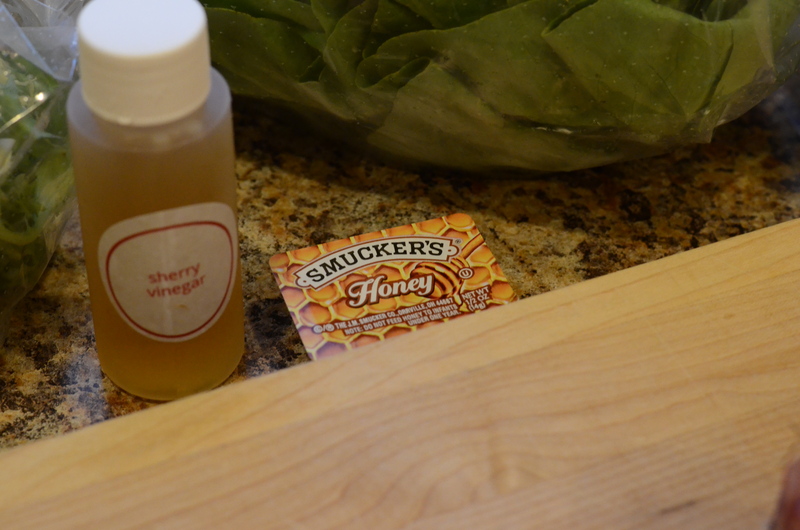 Using these quantities and caramelizing on the stovetop with a little more water would probably be fine. 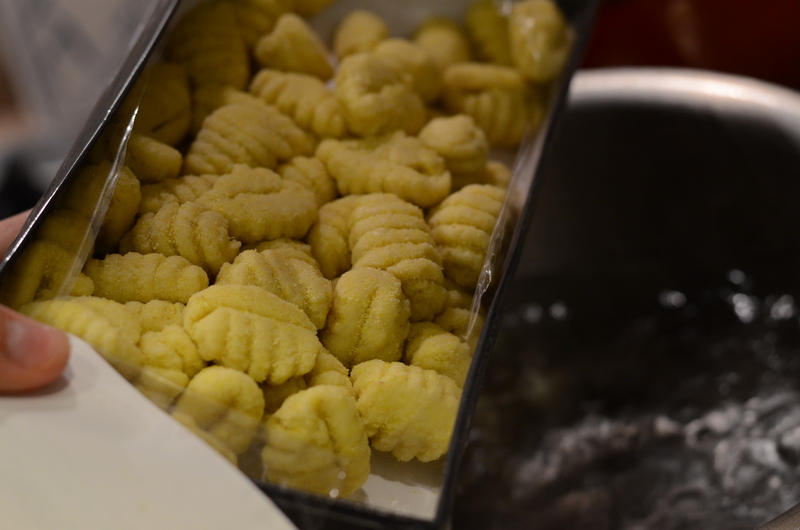 Once they are coated in melted sugar, pour onto a sheet to cool. Transfer to an airtight container and use for any and all salads. Or snacking. 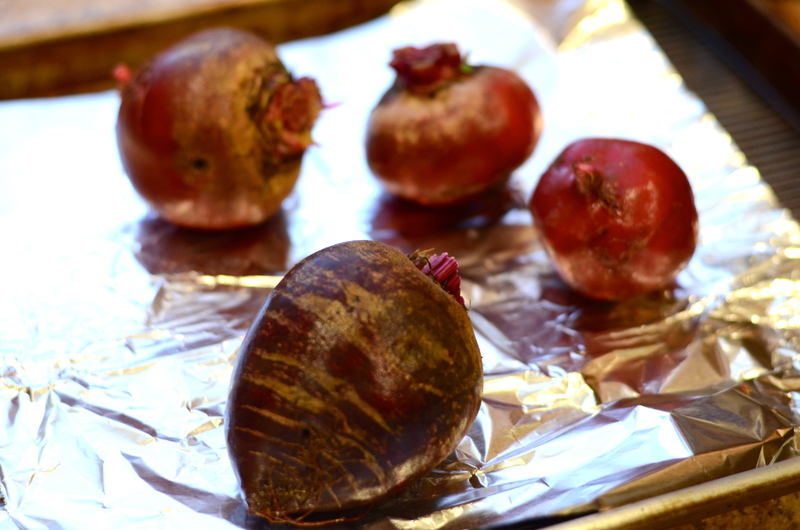 For roasting the beets, heat the oven to 350F. 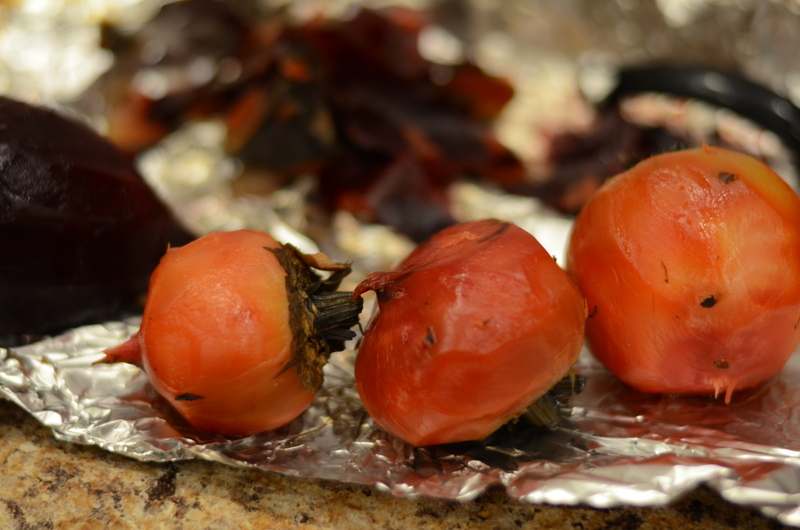 Trim the beets before roasting. Wrap in an aluminum foil packet with a little sprinkle of water. 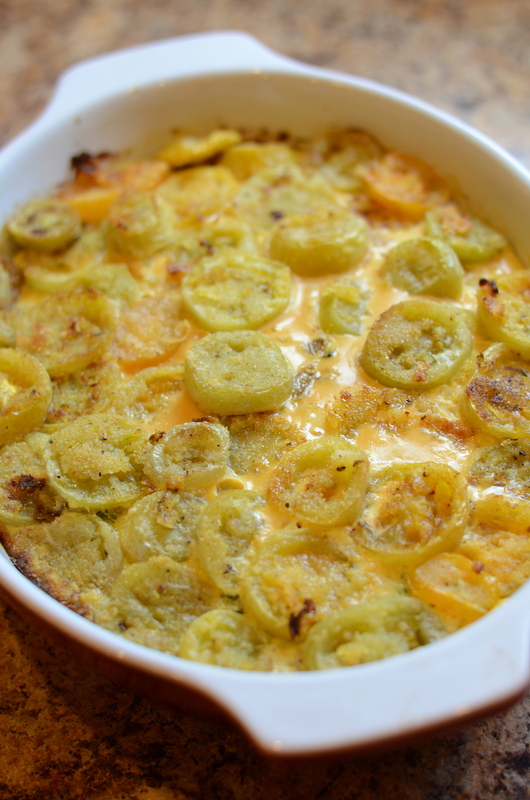 Place on a roasting pan and cook until tender when pierced with a fork (check at 45 minutes). Once done and cool, they should be easy to peel. 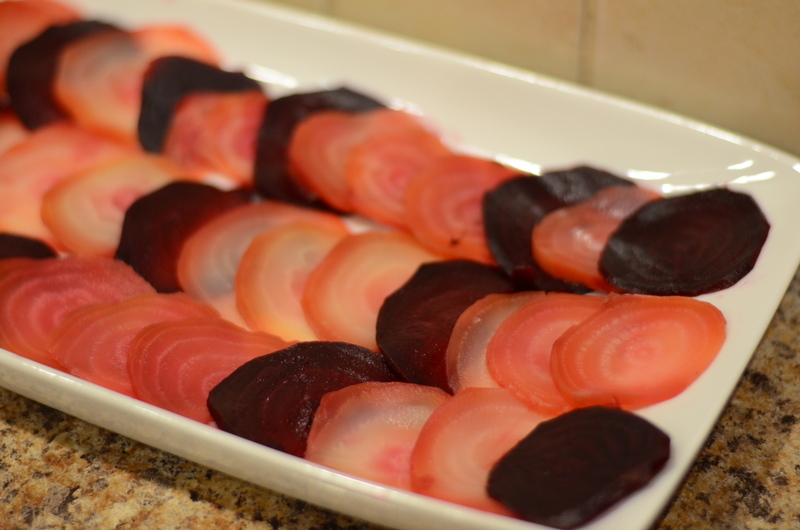 Slice the beets thinly and layer on a white dish, alternating colors. 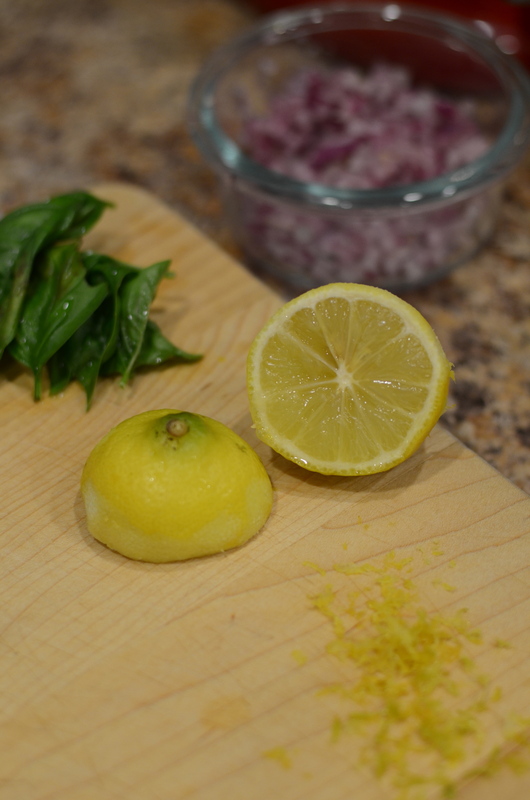 Prepare the dressing ingredients: lemon, basil, onion, and olive oil. You could add a pinch of sugar or a drop of honey if you want more sweetness. 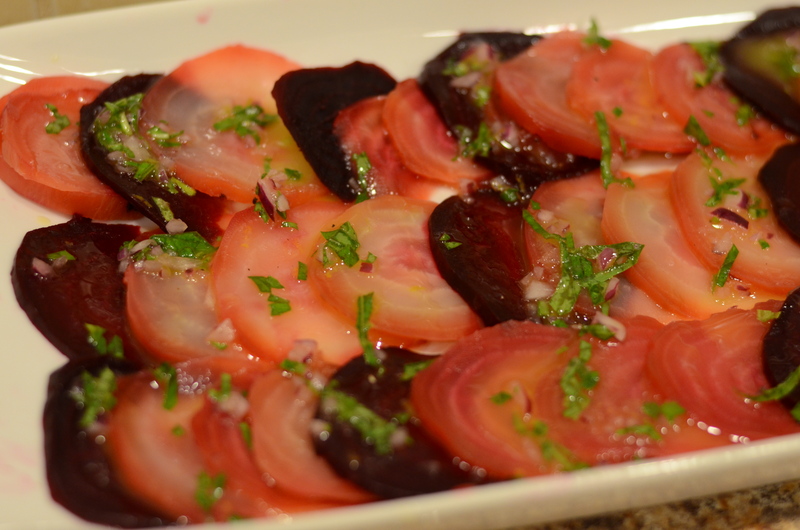 Drizzle dressing evenly over the beets. 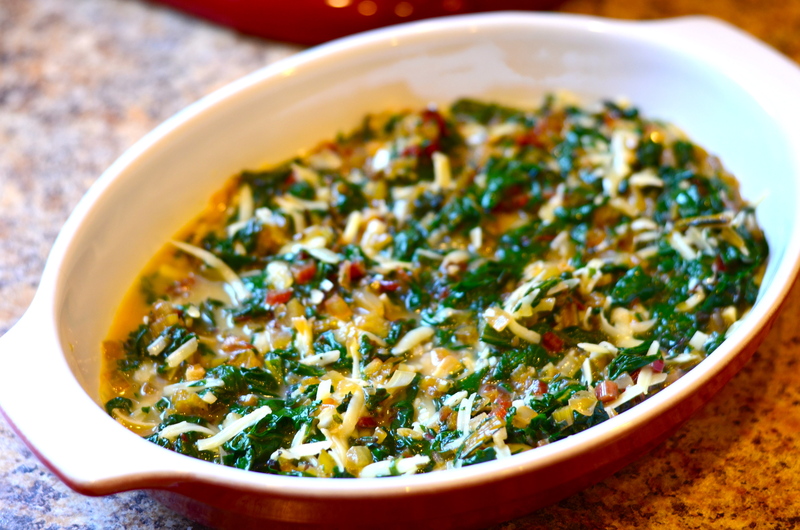 Top with crumbled goat cheese, walnuts, prosciutto slices, and capers. 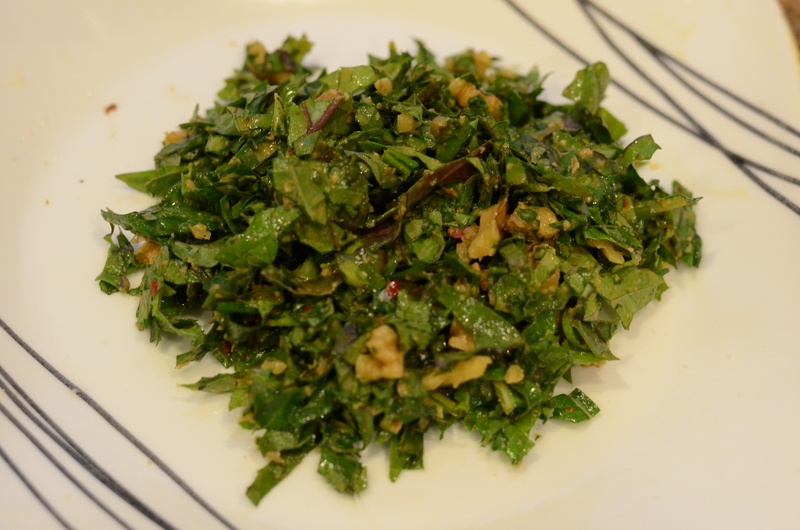 The assembled salad keeps well and develops more flavor in the refrigerator. 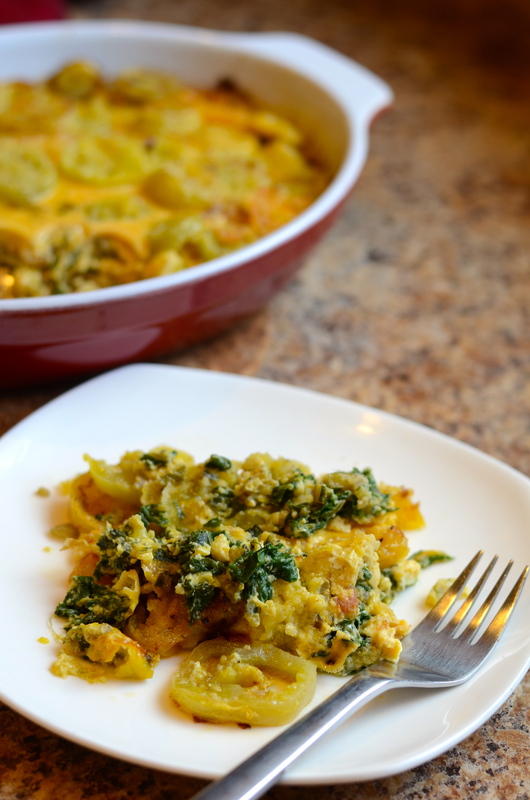 Because it looks so beautiful, you won’t hesitate to reach for any leftovers! 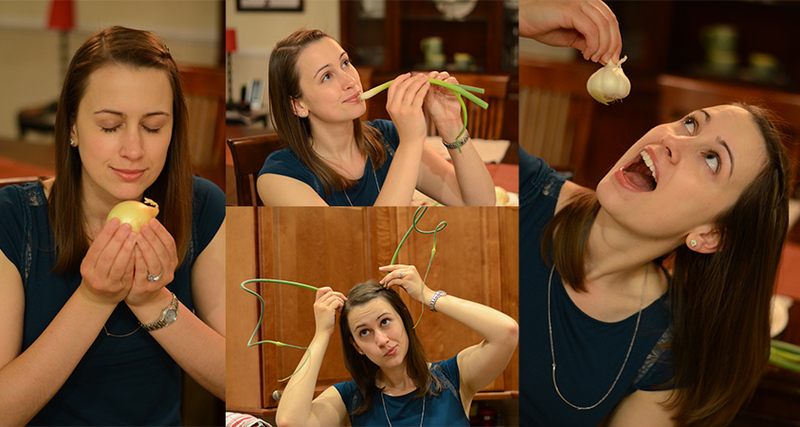 It’s no big secret that I’m a big fan of vegetables in the garlic and onion family, also known as Allium vegetables. 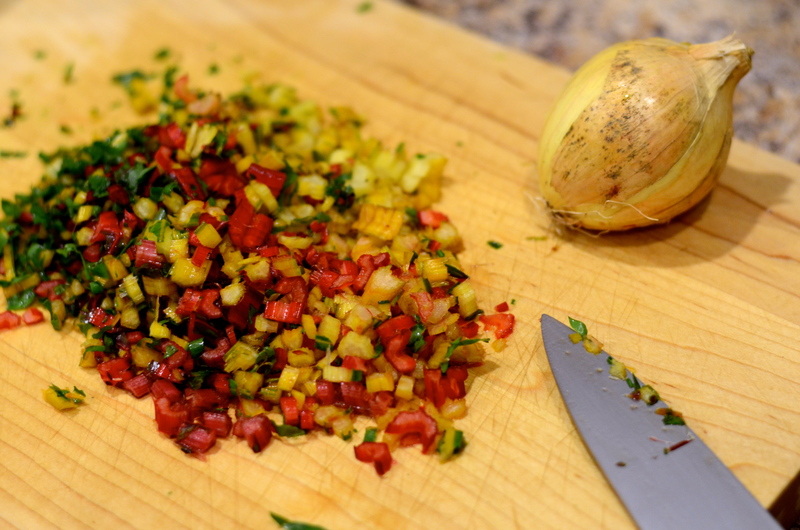 I haven’t yet gone to the trouble of calculating, but Allium species ingredients may be in 95% of my recipes on this blog! 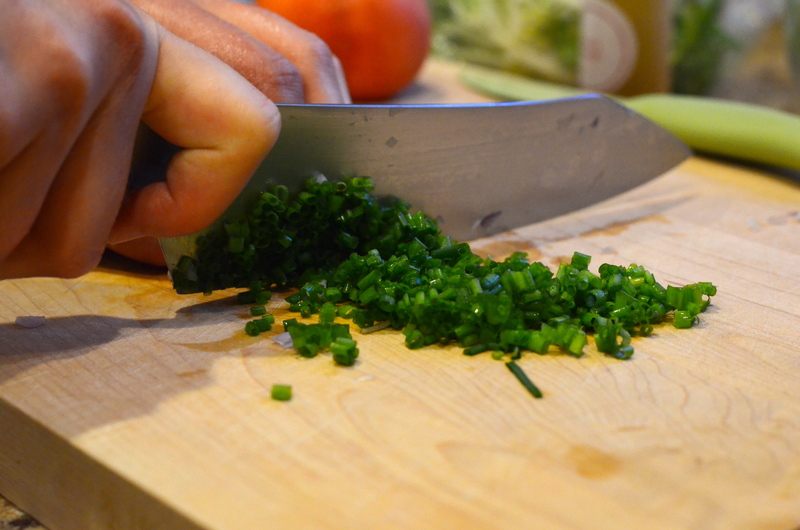 Onions, garlic, scallions, shallots, chives–I love ’em all. One of my favorite bulbs that blooms in spring happens to be named Allium as well! Those flowers peaked weeks ago. The time for ramps has passed. Summer officially began last Saturday, and what do we have now? Garlic scapes. Those are the antennae in the goofy photo above. 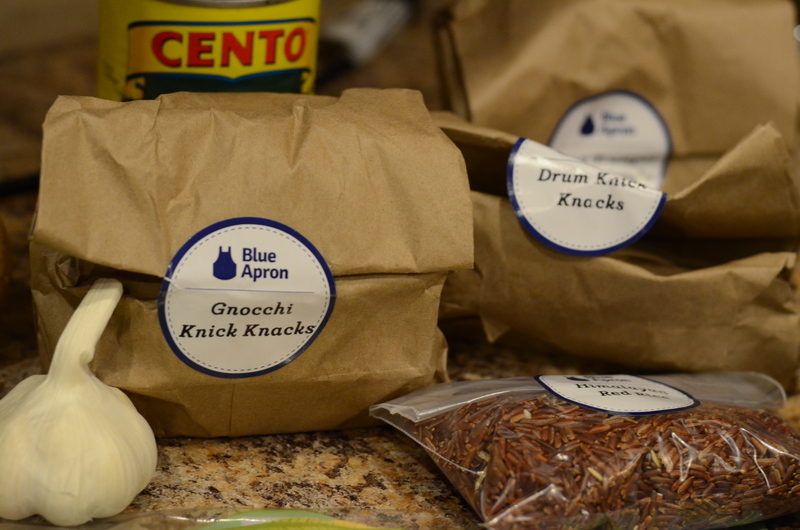 I found an exciting way to use my scapes among Blue Apron’s weekly meal offerings. I like that they publish recipes on their website without requiring you to purchase the boxes, like I did recently. I’ll be honest, the recipe probably caught my eye because of the prominence of a slightly soft egg yolk in the picture. Also, it’s about time I join in on the country’s enthusiasm for ramen (though I refuse to make it with American cheese). As a soup, you can really design this dish however you want. I chose to shop for a few items (mushrooms, peas, nori, and ramen noodles), and I had the rest ready to go. 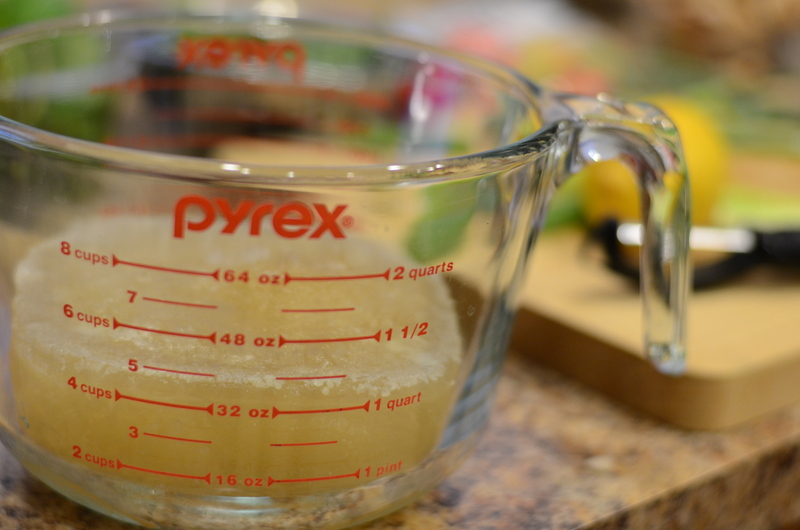 I thawed a chunk of homemade [chicken] broth I had stowed away in the freezer for something like this. 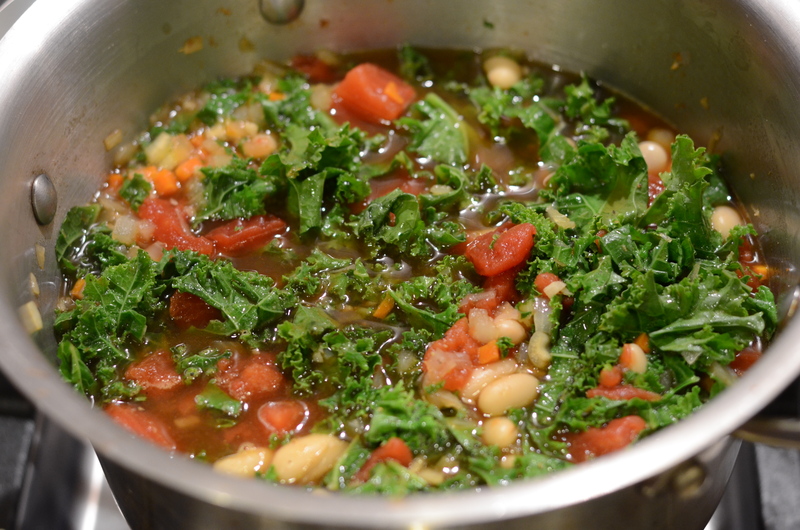 You really can use any broth, but obviously you’ll need vegetable if you’re keeping it vegetarian. 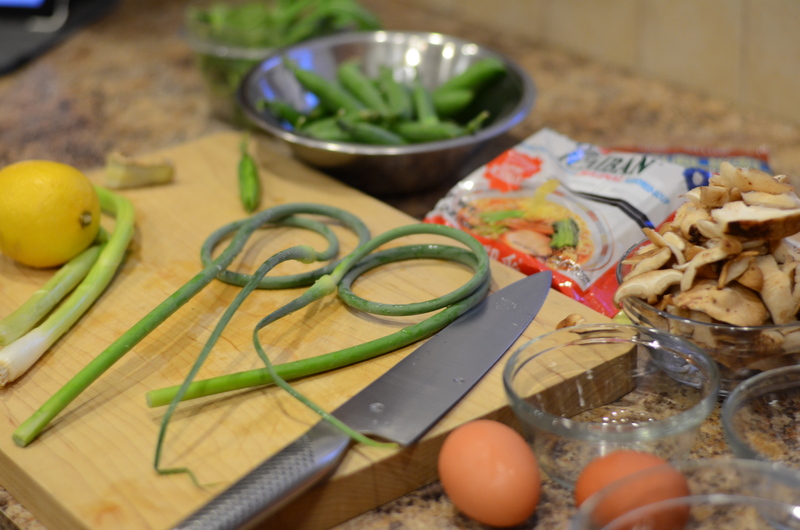 Take out all your ingredients for preparation, including the eggs. The eggs should come to room temperature before cooking. I was particularly nervous about this step because when I attempted to make hard-boiled eggs last week, I followed Martha Stewart’s instructions here, and it was a major failure. 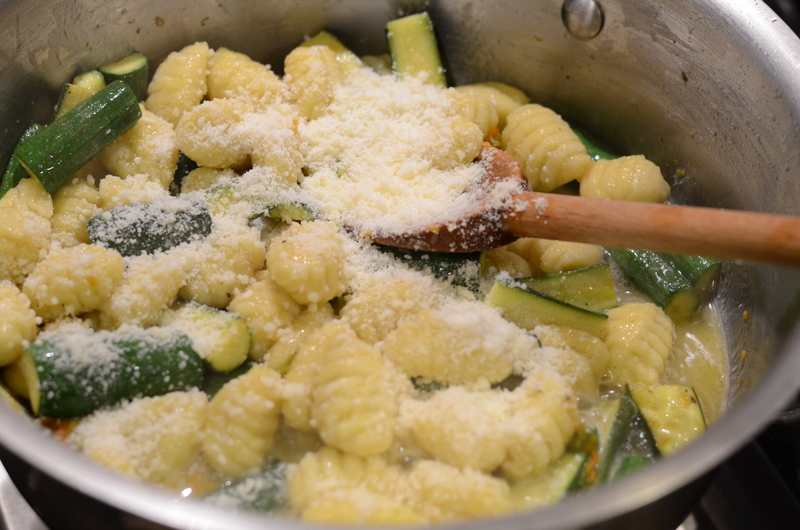 Set a pot of salted water over high heat and bring to a boil while you prep all of the vegetables. 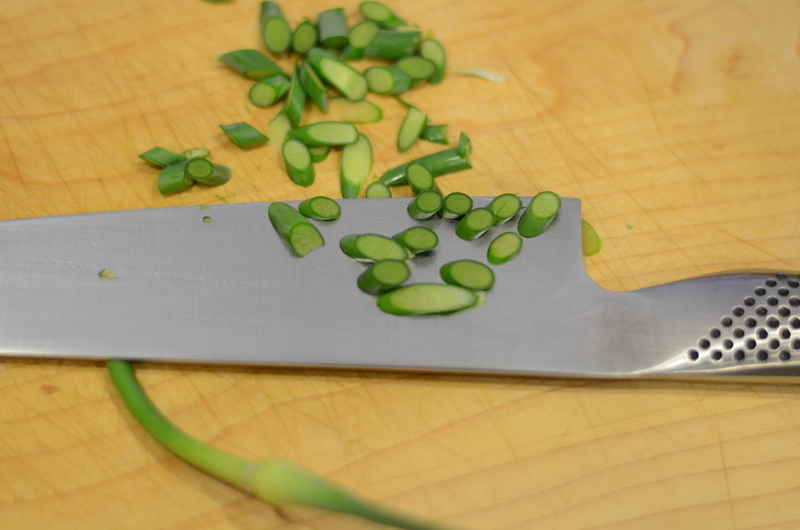 Tip: you can use one prep bowl for your sliced garlic scapes, the whites of your scallions, and the minced ginger. 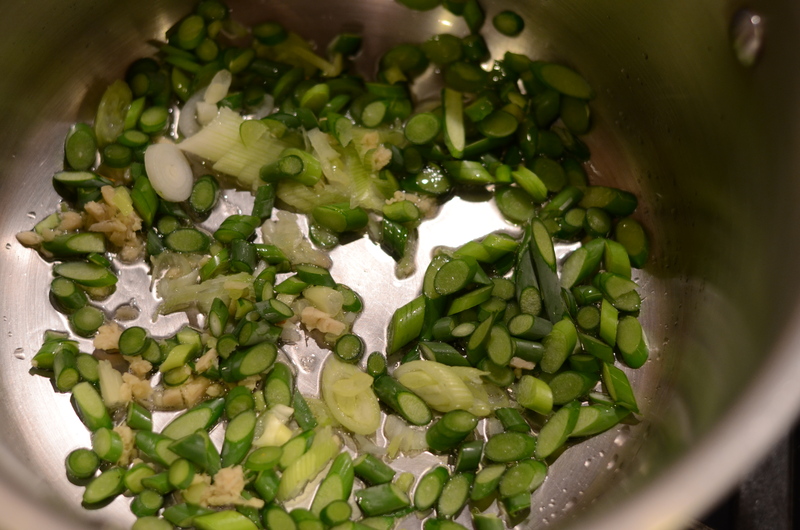 The green parts of the scallions should have their own bowl. The shelled peas have their own bowl. 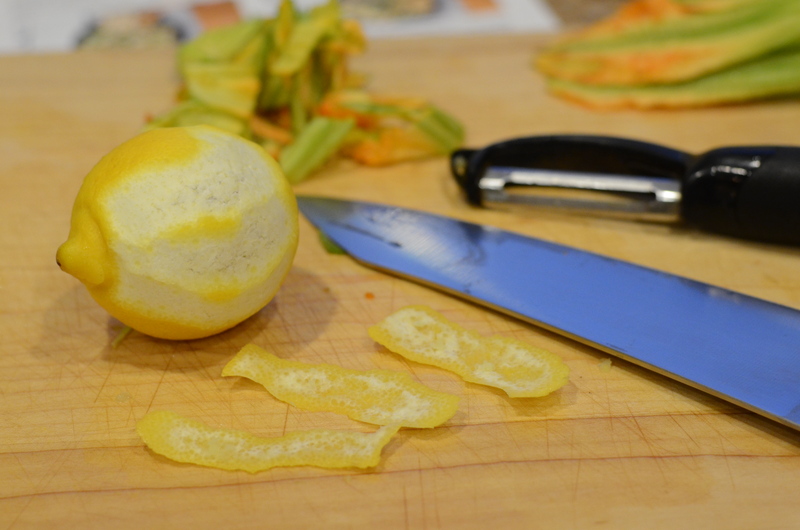 Remove some of the yellow rind of the lemon with a peeler. Avoid the white pith. Mince the rind finely. Measure 2 teaspoons and set aside. 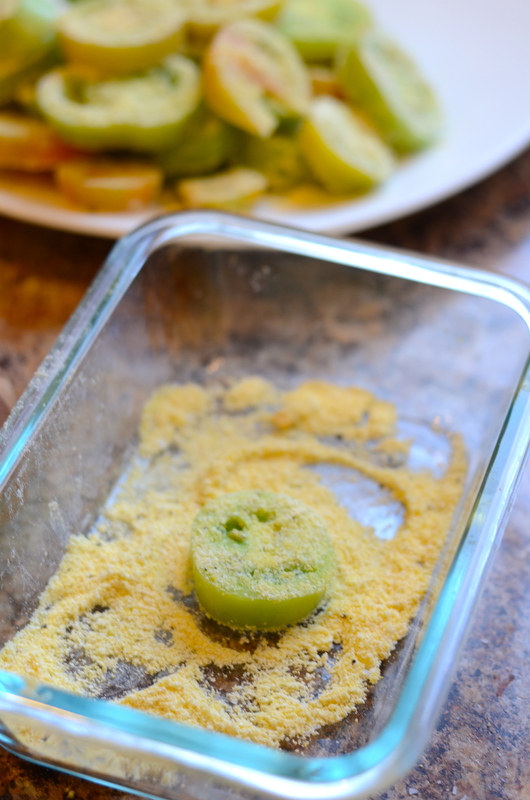 Quarter the lemon, remove its seeds, and set aside. 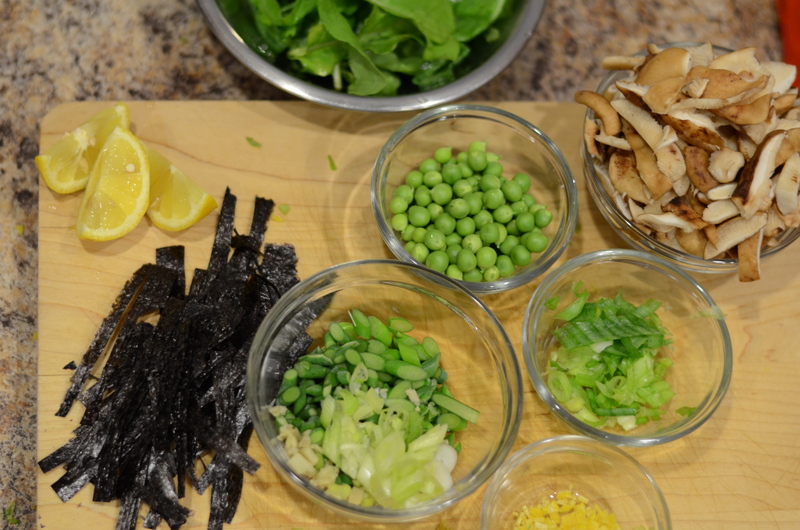 Make thin strips of nori with a knife or scissors (one of my favorite kitchen tools!). Carefully add the room-temperature eggs to the boiling water and set a timer for exactly 7 minutes. 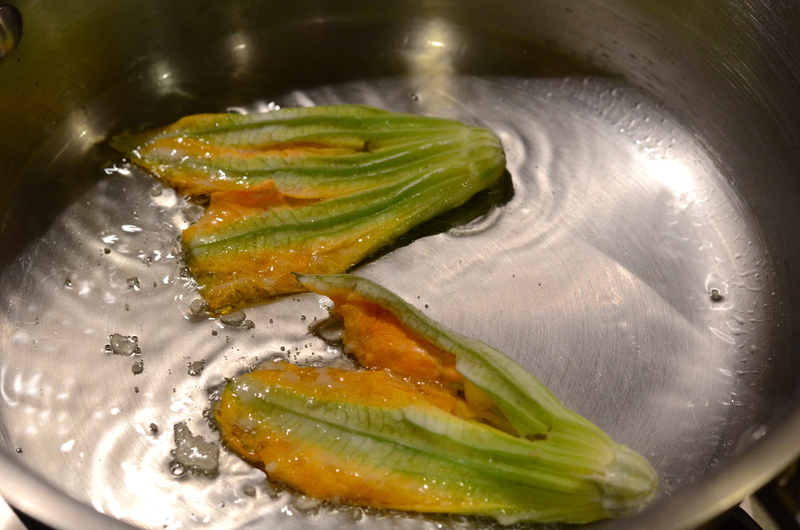 Then drain and rinse under cold water for about a minute to prevent them from cooking further. In the same pot in which you boiled the eggs, set some more salted water to boil (yay less dishes!). 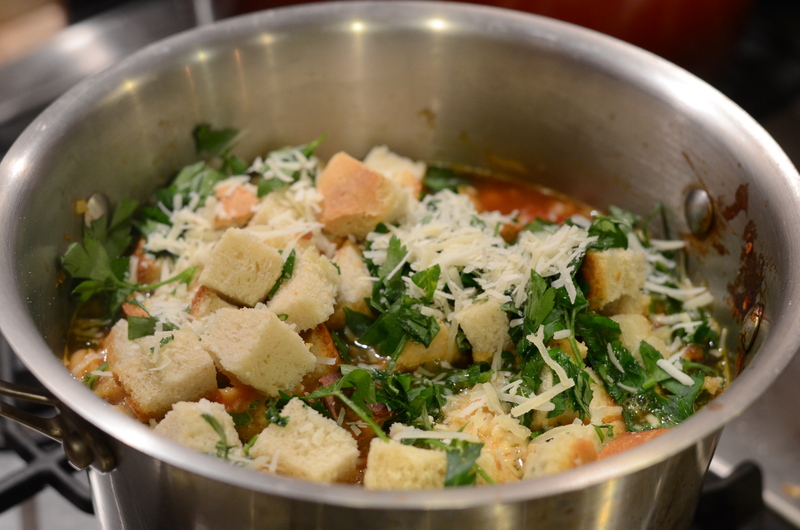 In a second, larger pot, add about 2 teaspoons of olive oil and heat over medium heat. 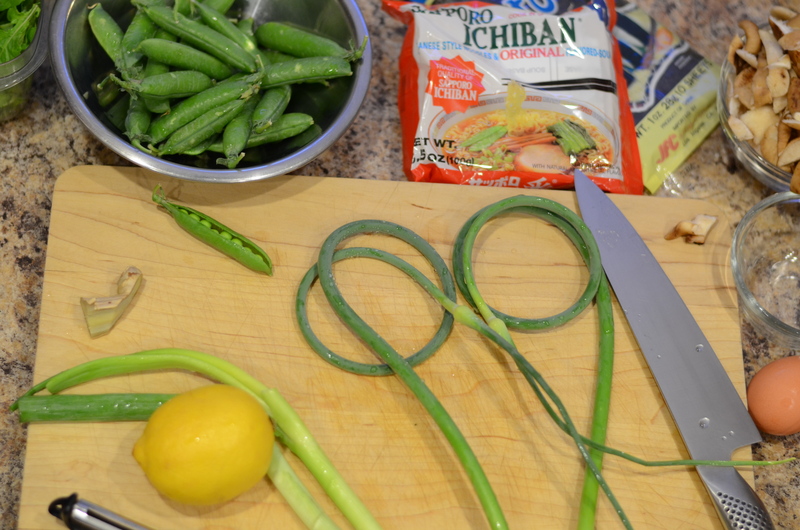 Pour in the ingredients in your one bowl of scapes, green onion, and minced ginger. Season with salt and pepper. Sauté for a minute or two until slightly softened. 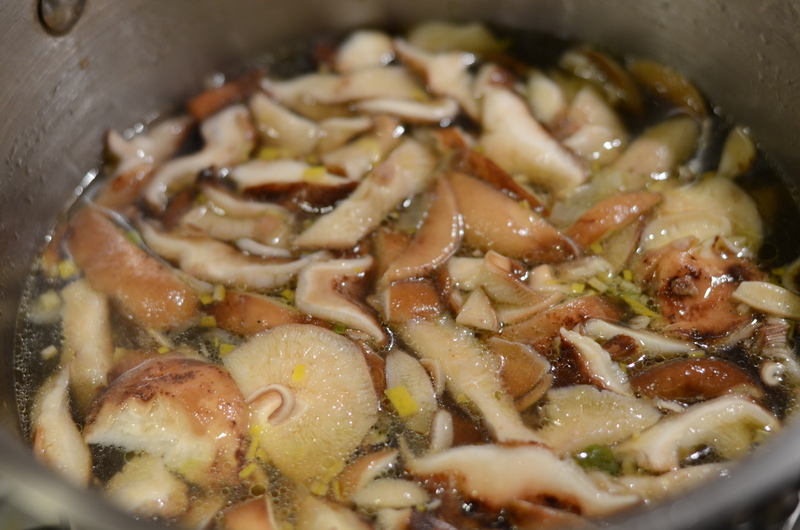 Add the mushrooms and cook for about a minute more. 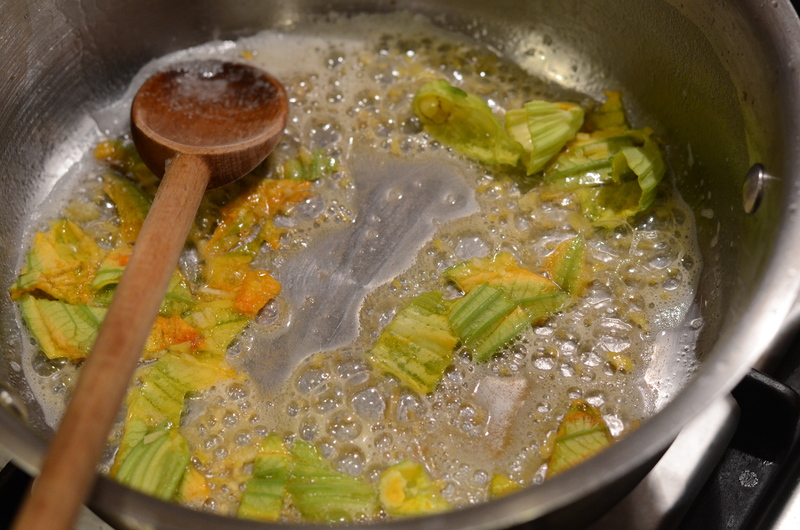 Then pour in the vegetable broth, soy sauce, and lemon zest. Squeeze in the juice from two of the lemon wedges, to start. Increase the heat to bring the broth to a boil. Then lower the heat so the mixture simmers; let it go for 8-10 minutes. 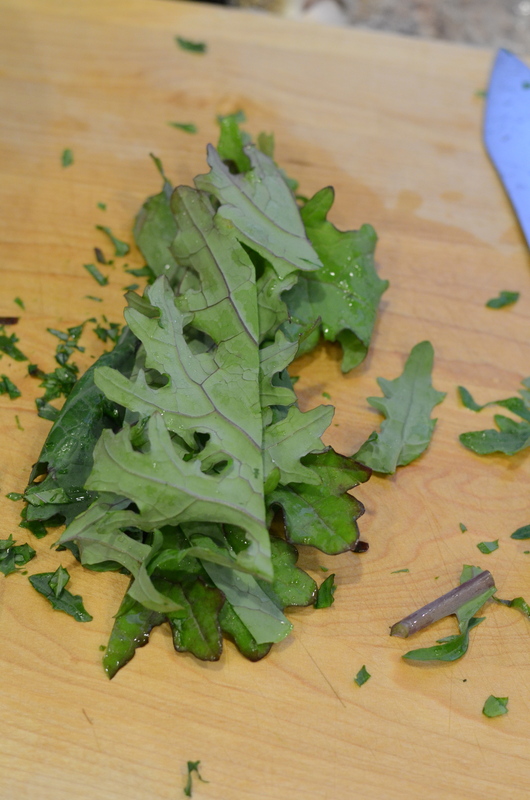 Squeeze lemon juice over the arugula and toss. Add salt and pepper. When the broth is about ready, stir in the peas, season with more salt and pepper, and remove from heat. Leave lid on to keep warm while you cook the noodles. Add the noodles to your pot of boiling water, stirring to separate. Cook according to package directions. Drain rinse with warm water. 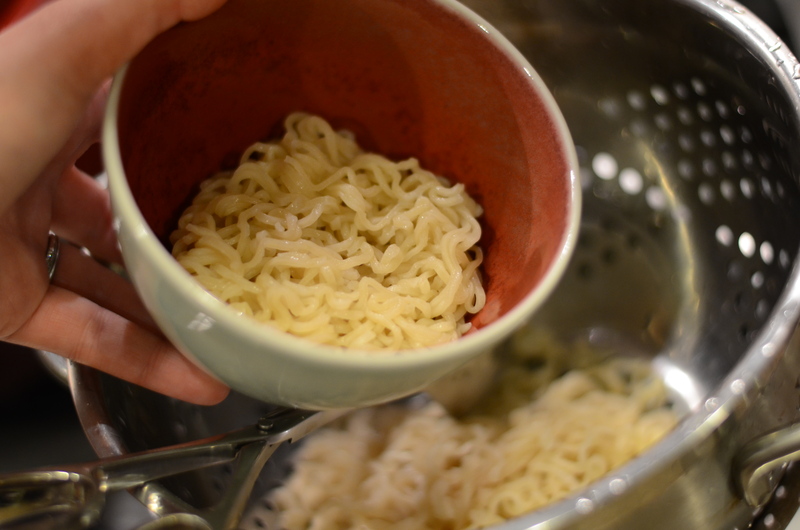 In two large bowls, divide the noodles. Pour broth in bowls. 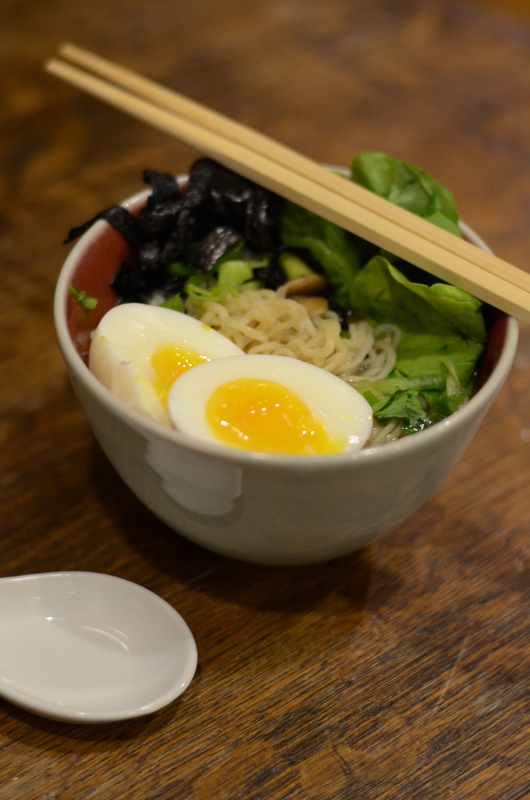 Garnish with the dressed arugula, scallions greens, nori strips, and eggs. Add a bit more lemon juice if needed. 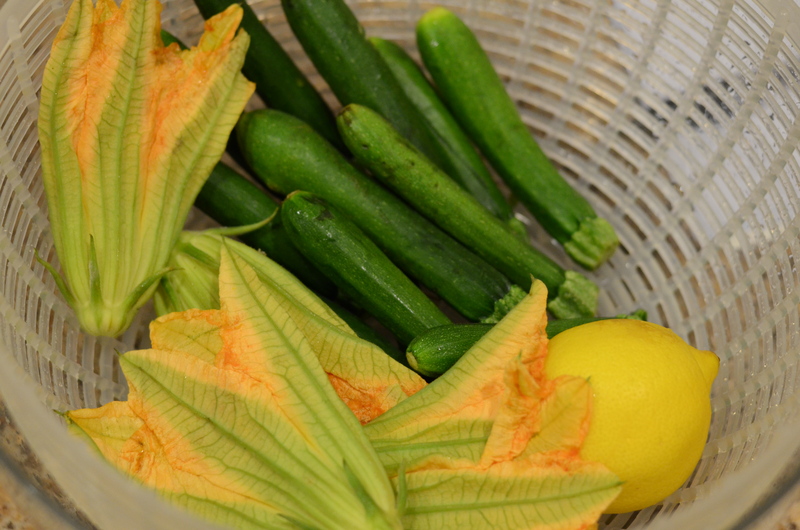 What came in this week’s farm share? 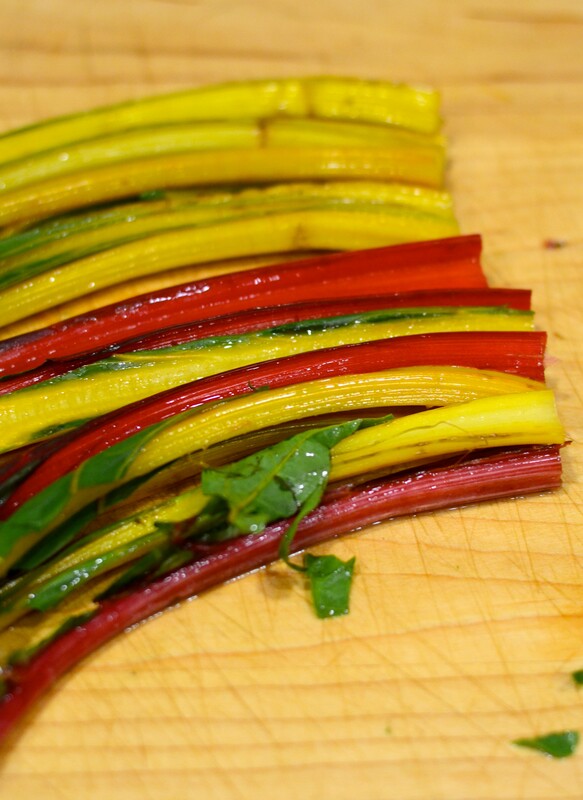 It is the time of year to have greens on the brain. My Golden Earthworm Organic Farm CSA started distributing its shares just three weeks ago, and I am already racing to keep up. 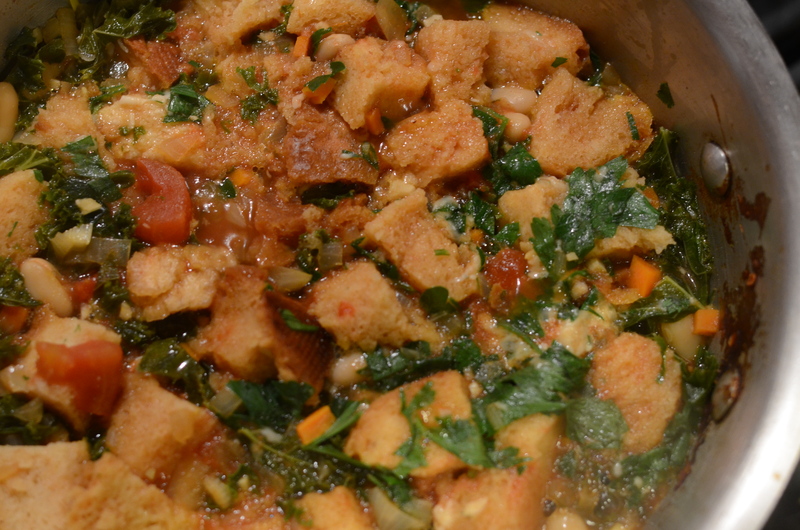 I don’t to come across as complaining–this is some of the freshest, most nutritious food I can eat. And remember Crystal’s experiment? You might be interested in catching up with her here. Sounds like she might enjoy salad right now. I used recipes from all different sources for my weeks’ inspiration. There was the Warm Orzo Salad with radishes and Dijon vinaigrette, from Good Housekeeping magazine, which I ate spooned over mixed greens. I cracked open Alice Waters’ The Art of Simple Food II to mix it up and make Red Romaine Salad with Sherry Vinegar and Garlic. 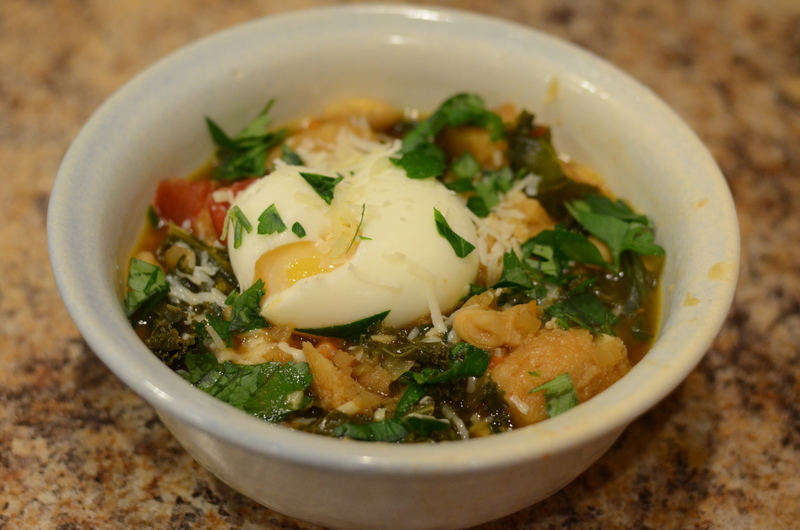 Joy the Baker inspired me to use the baby kale in her Tuna, Kale, and Egg Salad recipe. 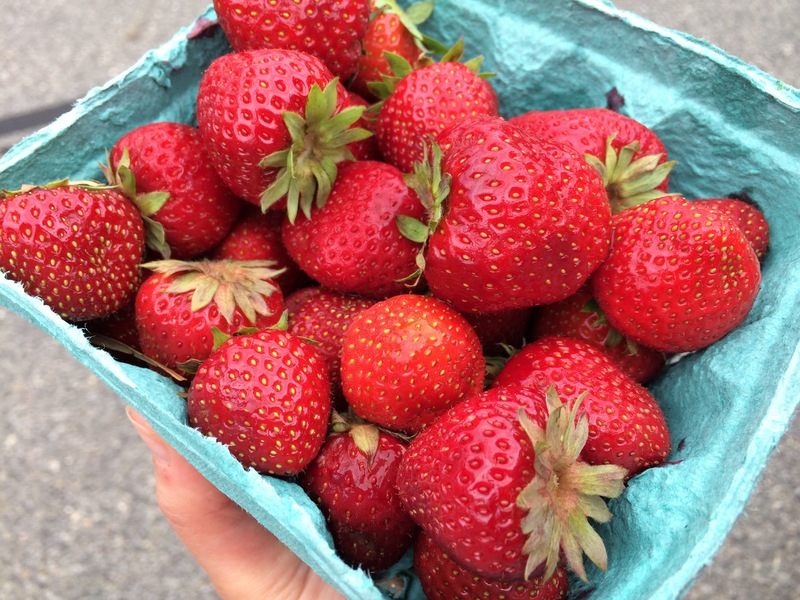 A real highlight, these strawberries arrived in last week’s share. Eating them sliced over arugula with balsamic glaze drizzle was almost as good as dessert, and I didn’t even add the usual goat cheese! One particular kale salad I made last week was special. 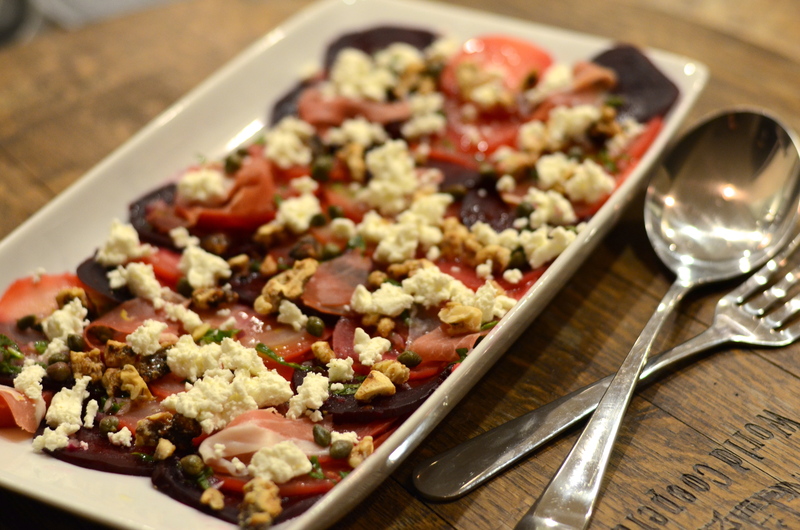 It was a rock star salad; it rocked with flavor. Since kale is so hip, perhaps I should call it a pop star salad? If so, it would compare to those pop stars you think of and say, “he’s so famous, he can’t be any good,” and then you end up being impressed by his talent. 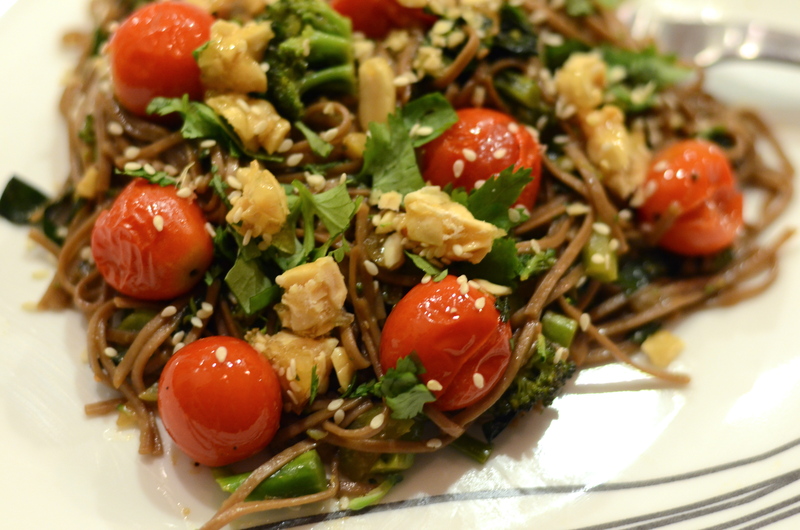 Once again, this salad has an Asian flair–the soy sauce, the spice, the peanut butter. It reminded me of the flavors I loved so much at a restaurant named Chin Chin, in Melbourne, Australia. It’s the kind of heat that makes your nose run a little, but you don’t feel like you’re dying. *These quantities aren’t meant to be precise. I realize that a “large” bunch is very subjective–usually one of my pet peeves in recipes, so I should have given you a weight by ounces. 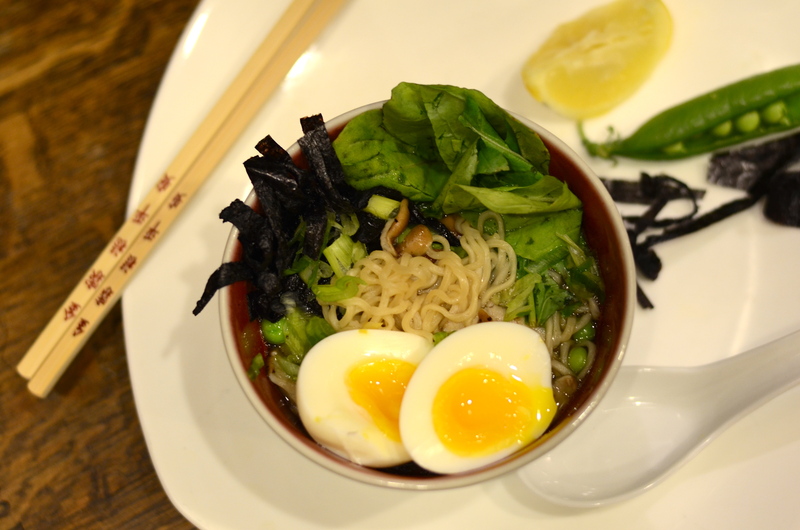 But the idea is to vary the ratios based on your taste preferences and what you have at home. 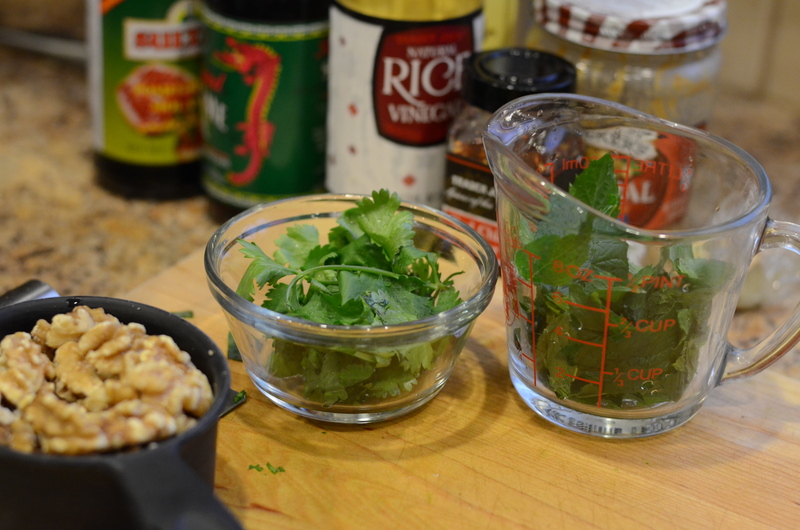 In my case, I had leftover cilantro, a herb that would sensibly fit in with this flavor profile. 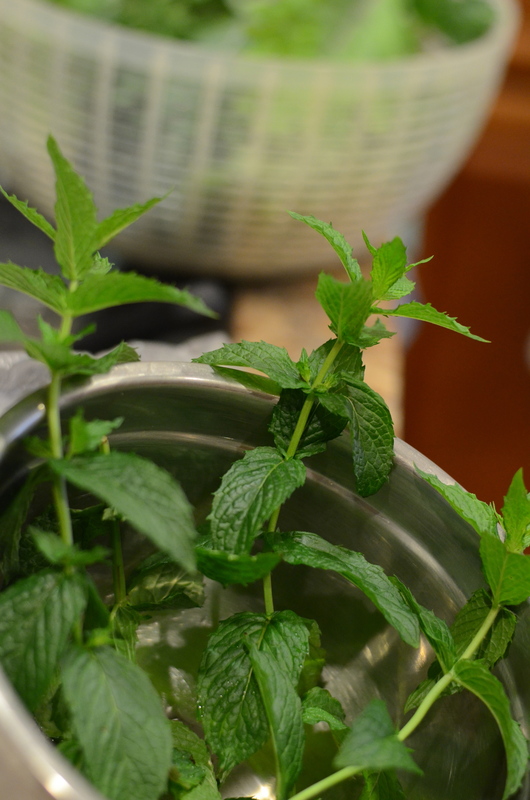 Mint was one of the first plants to assert itself in my garden this spring. Some people consider them weeds, they take over so much. If you have to pull some up, try to use it in a salad before tossing the rest! 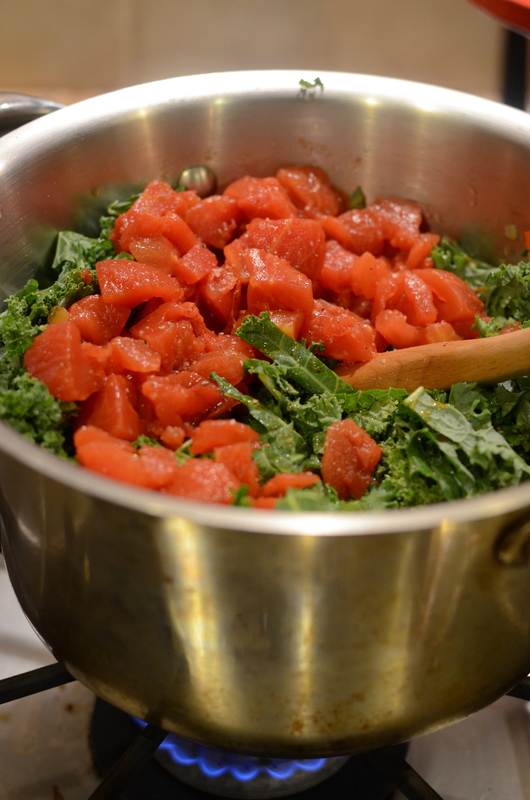 When you are prepping the salad, the step of mincing the kale makes such a big difference in the texture. 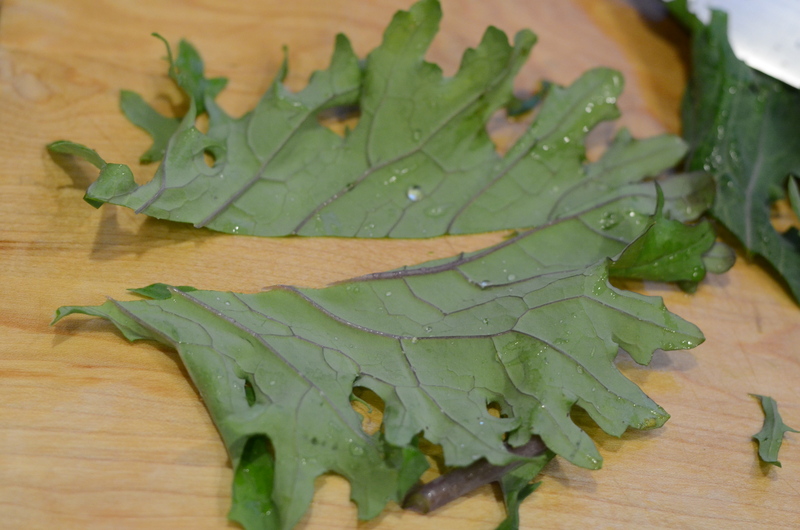 Kale can be tough, and this method helps tenderize the leaves without pre-cooking them. 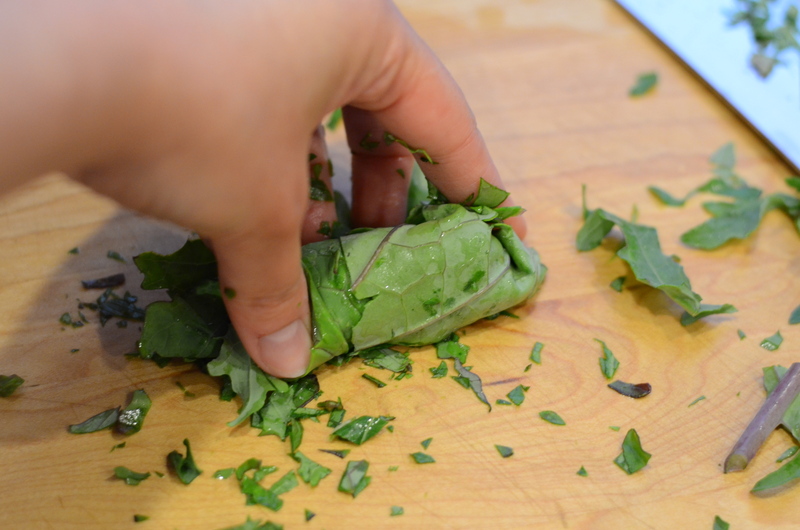 I found that the most efficient way to mince the kale was to remove the stems, stack and leaves, roll them up, and slice, using the chiffonade method. See below. 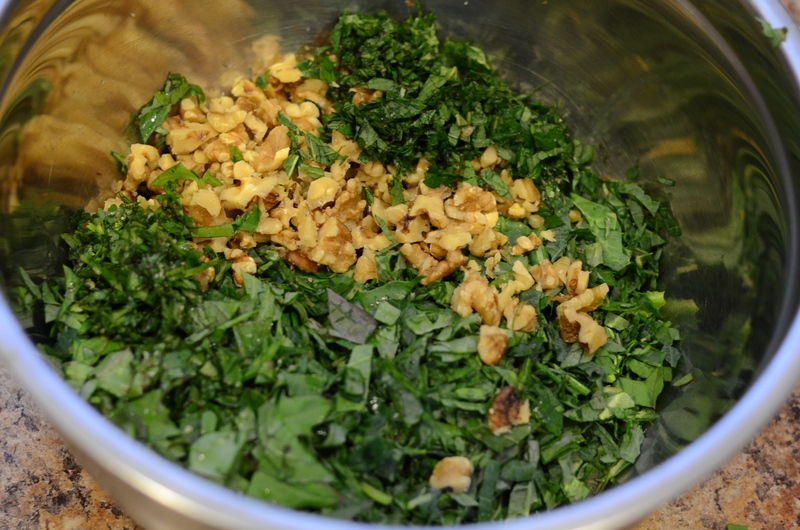 Toss the chopped kale, chopped herbs, and the walnuts together. 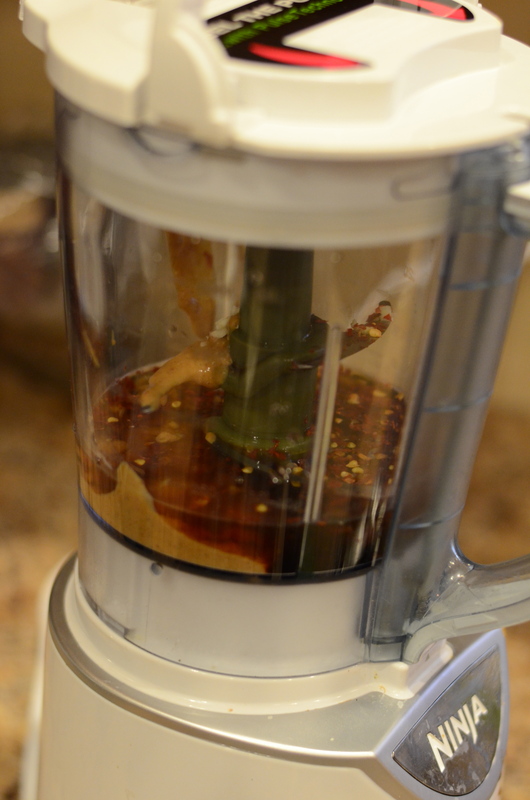 To a blender or food processor, add the peanut butter, warm water, garlic, rice wine vinegar, pomegranate molasses, soy sauce, minced ginger, sesame oil and red chili flakes. Mix at high speed until everything is smooth. So easy. 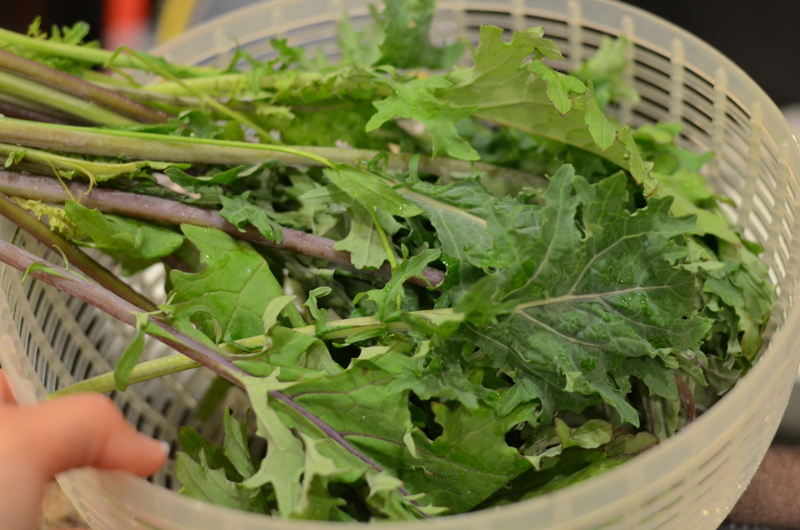 Since every bunch of kale is a different size, and every salad is going to be a different size, pour just some of the dressing into the salad at first. 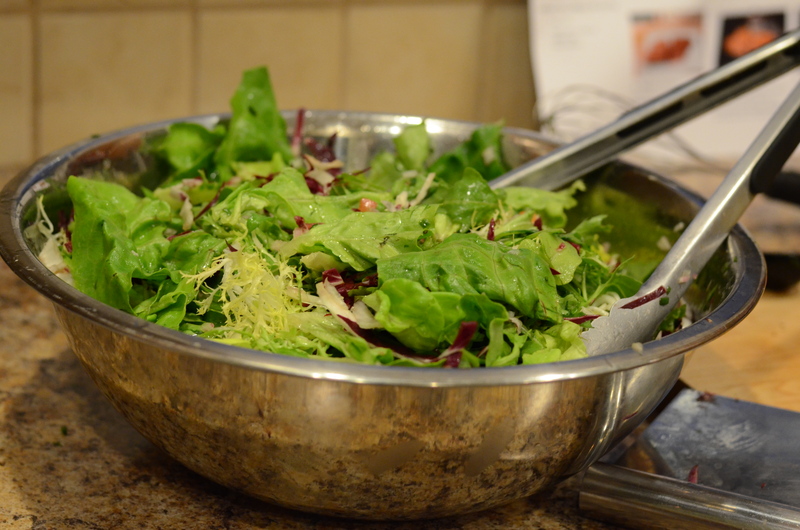 Add more as you go until you feel it is adequately dressed, and save the rest for another salad. I see more rock star salads like this in my future. But the next batch of green lettuce I get? I think I’ll put some on a burger. 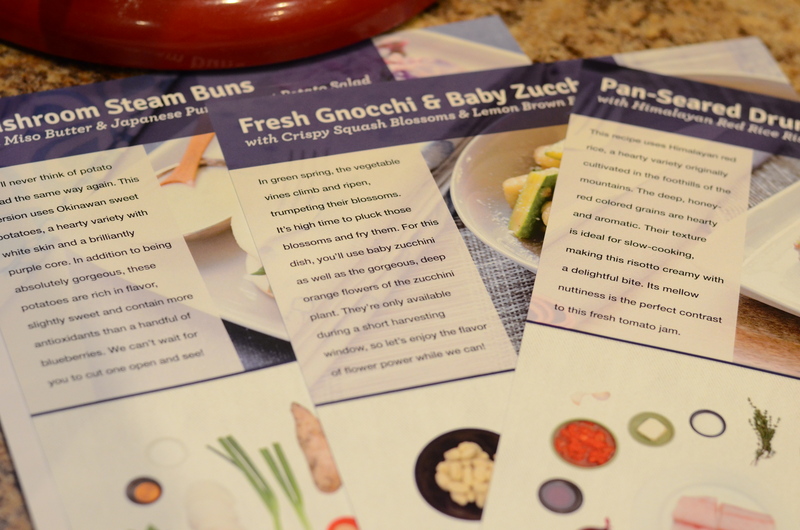 Last year, I ordered a box from Hello Fresh so I could test out the recipe-kit home delivery service. 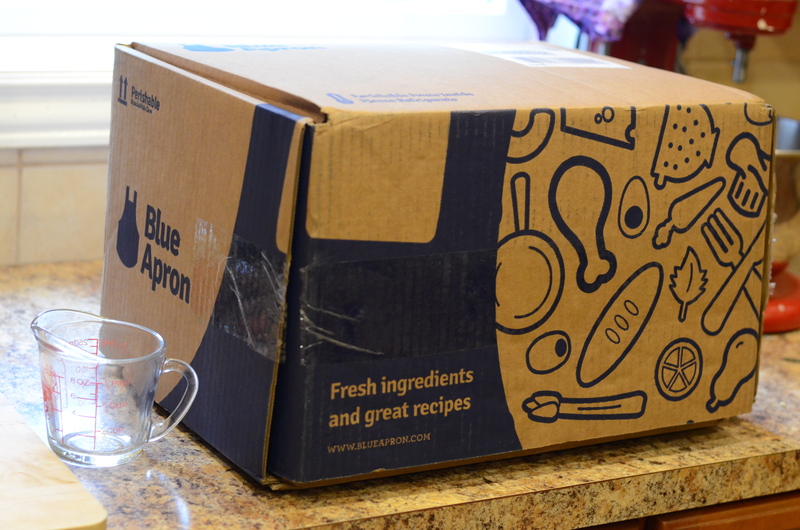 These types of meal kits are now delivered by a growing number of companies, suggesting that the model appeals to a substantial number of people. Or perhaps it is a fad. It would be great if these were an answer to the question I often hear from my single, on-the-go friends: if I buy ingredients to cook at home for myself one night, what am I supposed to do with all the excess? I’m only one person! I’m not so sure these boxes are the perfect solution. My conclusion about Hello Fresh was that its meal options were good and the prices fair, but the ingredient ratios were off, the instructions incomplete, and the serving count questionable. 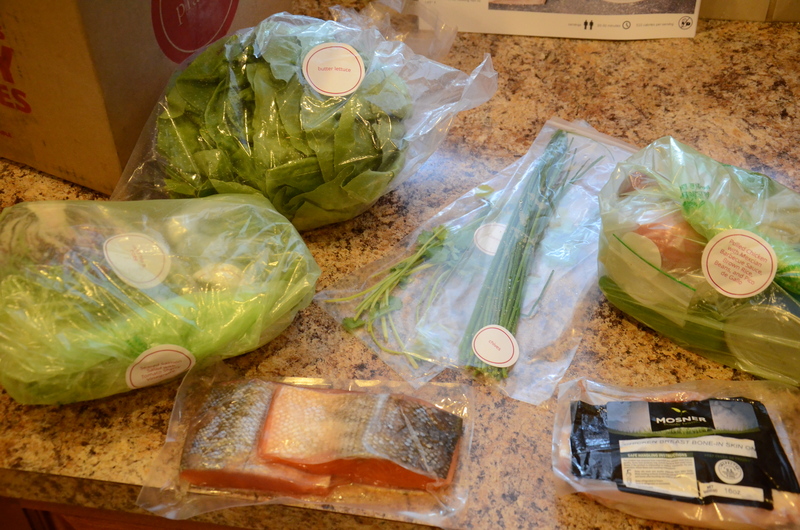 I also wished that Hello Fresh could somehow consider the fact I have a more well-stocked pantry than most. A friend of mine had high praised for Plated, another service aimed at simplifying home cooking. Taking advantage of a promotion, I decided to give this one a try as well. I selected a seafood choice for one of my meals, once again, since fish is expensive. I’m also trying to incorporate the recommended two servings of healthy fish per week. My second meal choice was a pulled barbecue chicken with a pico de gallo salsa. 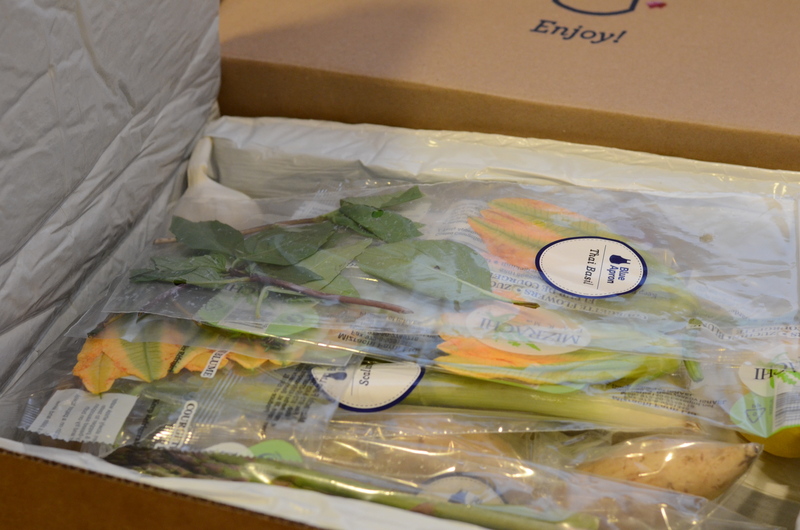 To assess Plated, let’s start with the packaging. The box is lined with an insulated bag. 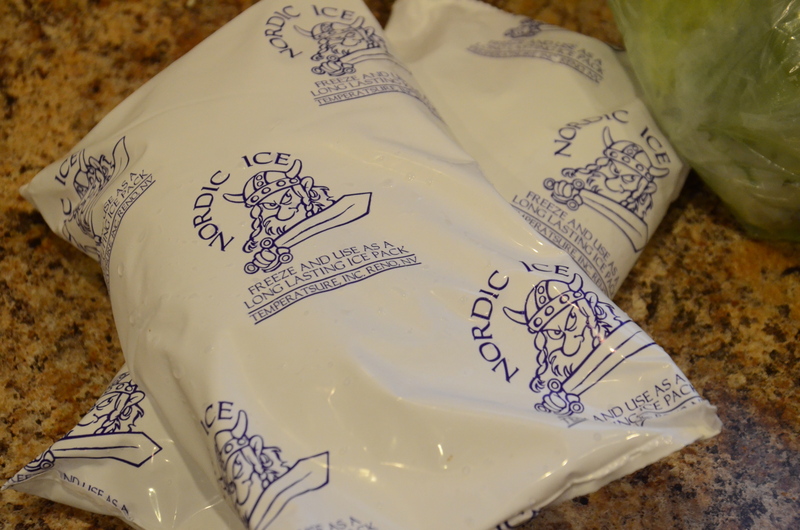 The meat and fish are stored in the bottom of the box, covered with frozen packs that are reusable. I will add these to my growing collection of ice packs! Then there’s the produce, some of which is in its own packaging, and some of which I find in the larger bags labeled by recipes. 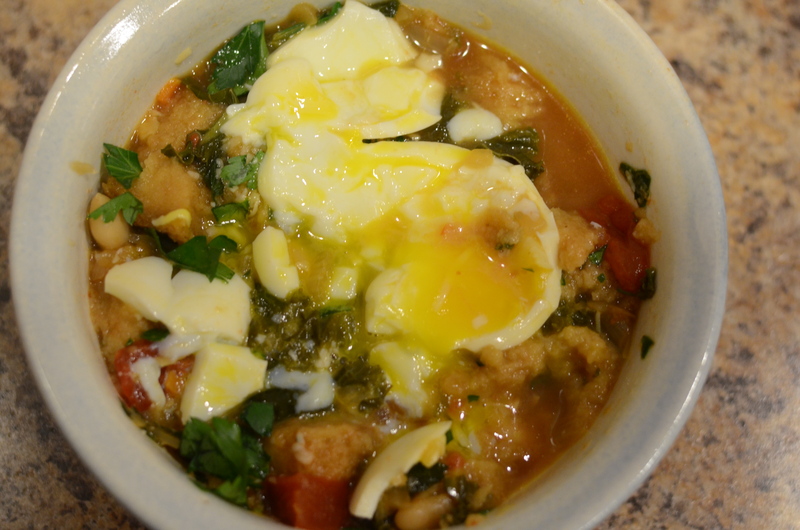 The fresh tomatoes didn’t fare too well with this; they were packaged near a heavy can of beans and ended up bruised. 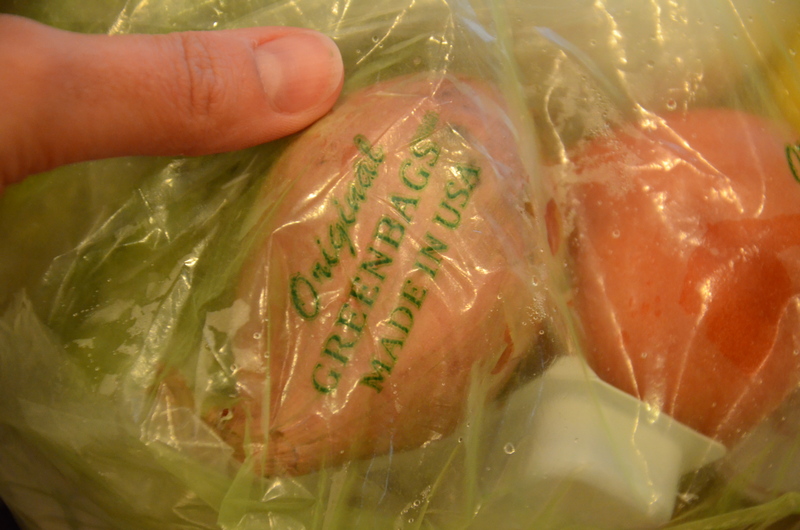 I saw that these bags were labeled “Greenbags,” which sounded familiar to me but I couldn’t recall the features. 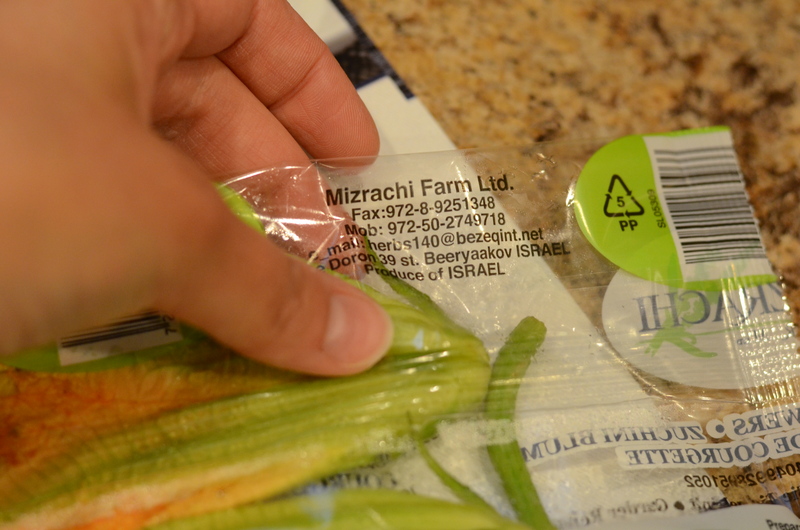 I got excited when I thought they might be biodegradable, but when I looked them up I didn’t see that in the description–they are meant to absorb the ethylene gas that can make produce ripen and rot too quickly. At least I can reuse them for other fruits and vegetables. I wasn’t ready to cook the day the box arrived, but it was easy to transfer the individual packages to the refrigerator. 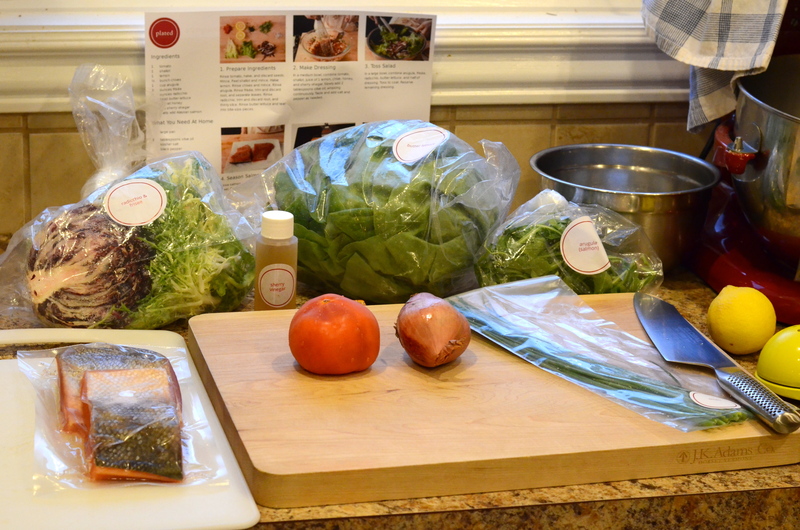 The next day, I pulled out my ingredients and recipe card for Seared Salmon Salad with Tomato Sherry Vinaigrette. 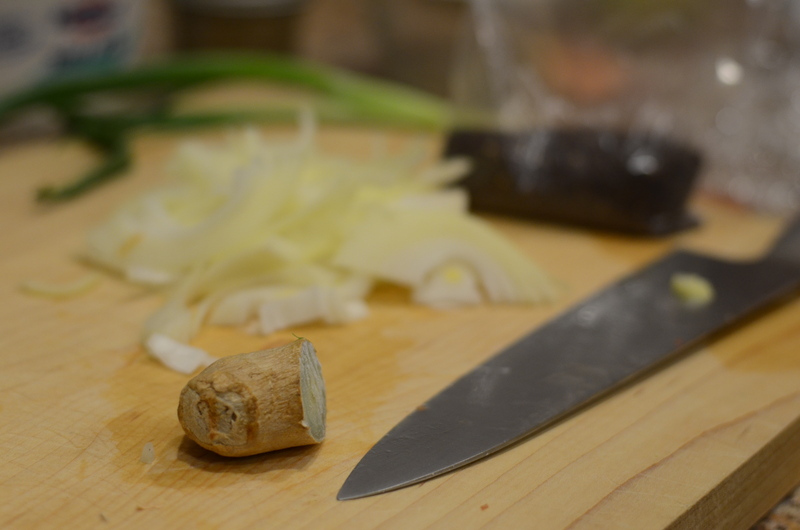 The first step on Plated’s card is “Prepare ingredients.” This is where it provides instructions such as “Rinse X. Rise and Mince X. Slice X.” I included some of those directions in my list of ingredients, like I usually do. 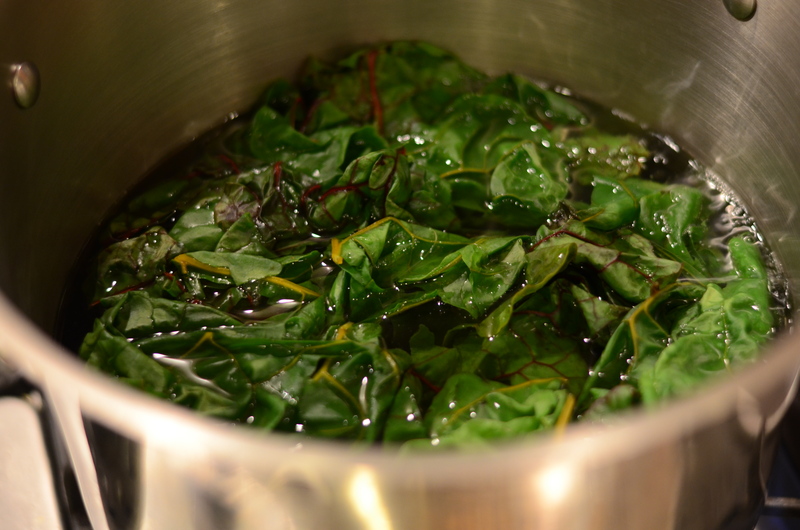 Basically, the salad dressing is made first, and then most of that is tossed with the greens. Right away, I made some disappointing observations. 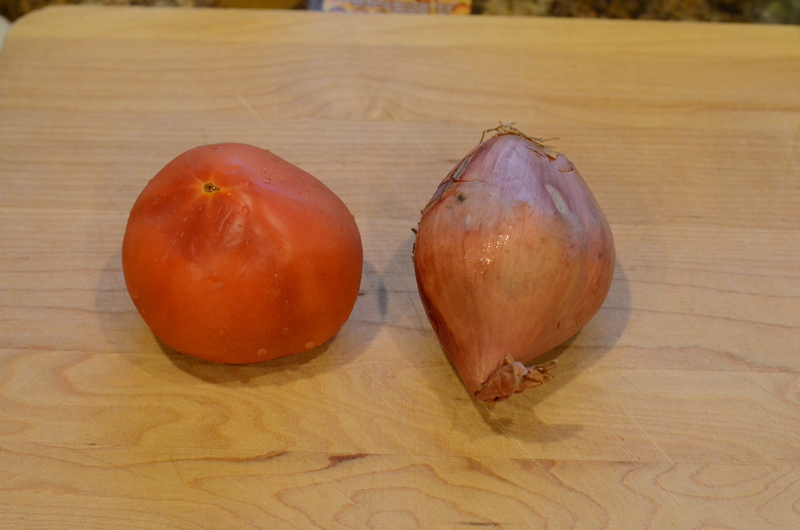 The shallot was fairly large, and the tomato was not. They were basically the same size. I made the executive decision to use 2/3 of the shallot, which was probably still more than necessary. 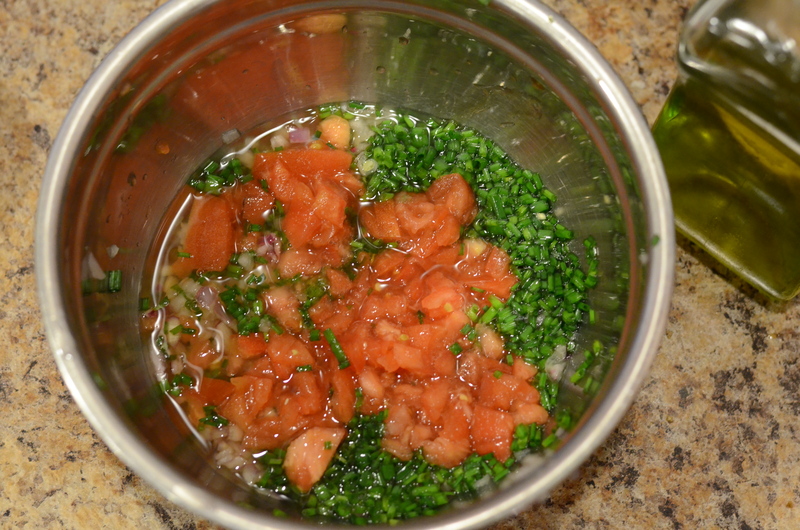 To make the dressing, combine tomato, shallot, chive, juice of one lemon, honey, and sherry vinegar. You can see that the tomato is a little mushy. Really, this is how the honey comes? Normal people don’t have honey at home? 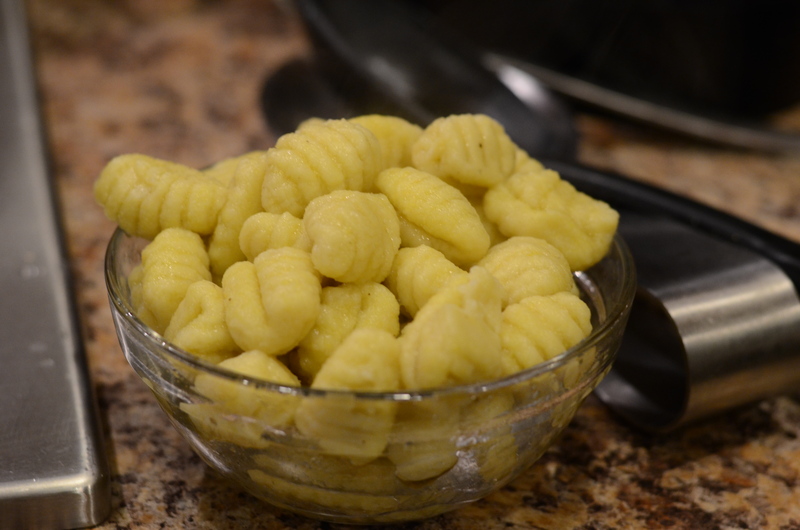 Gradually add 2 Tablespoons of olive oil, whisking to emulsify. Taste and add salt and pepper to season. 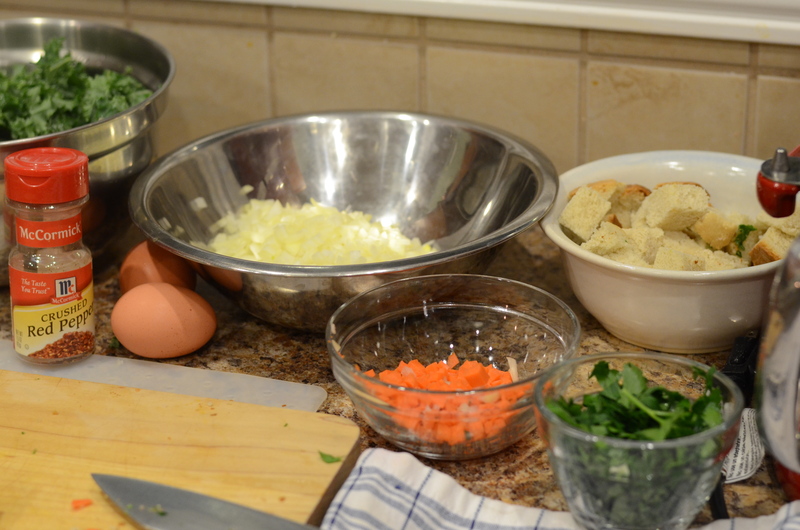 The next set of challenges involved the salad greens, which are to be combined in a large bowl. 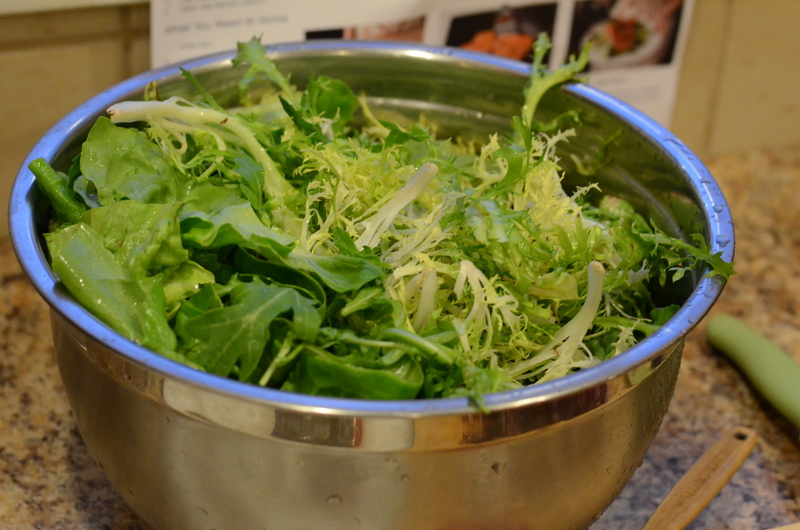 After everything is washed, the frisée is to be trimmed first to discard root (I didn’t seem much of a root), the radicchio needs its core removed and a thin slice, and the arugula can go in as is. 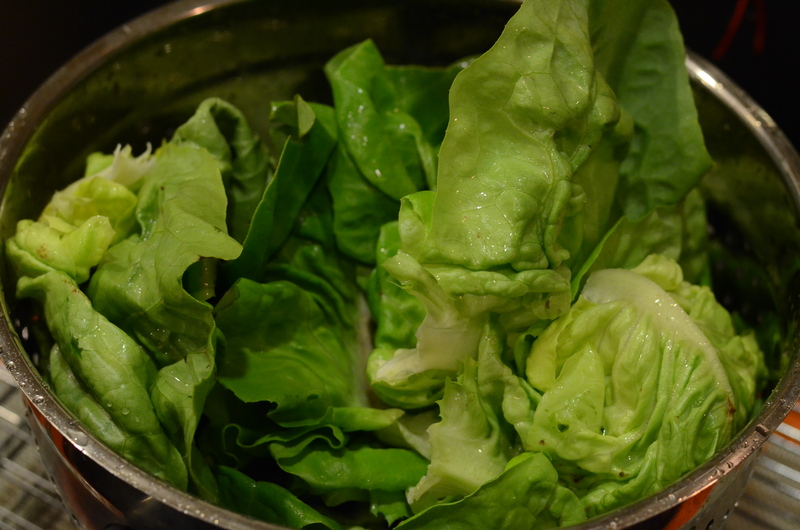 The instructions for the butter lettuce were “rinse and tear into bite-size pieces.” The problem: the head of butter lettuce was very, very sandy and gritty. That is not going to dissipate with a “rinse”–the only way to get rid of the grit is to slosh the separated leaves in a bowl of cold water, lift them out (leaving the dirt behind), and then rinse again in a colander/salad spinner. Unless you’re sure that people ordering this plate know about the persistent grit, I think it’s important to include cleaning tips like this. In addition, this was a massive amount of salad. I started with one bowl, but had to switch to a larger bowl to accommodate it all. I still had trouble keeping everything contained during the next step, which is to pour in half of the dressing and toss to coat. I’m pretty sure this is the LARGEST bowl I have. Time to prepare the salmon. The instructions say to rinse and pat dry with paper towels. I’ve never been a rinse-r of meats and fish, but since the salmon was sealed in some kind of liquid, I followed directions. The fillets were very soggy, so the drying step was key. Heat about 1 Tablespoon of olive or other vegetable oil in a pan over medium heat–something nonstick but heavy would be best. 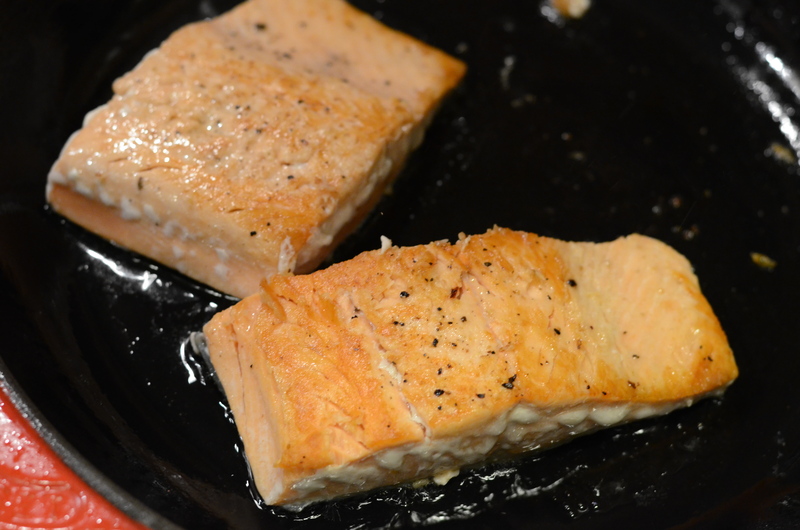 When hot, add salmon, flesh-side down, and cook until golden on the outside, 3-5 minutes. Repeat on the other side, careful not to overcook beyond medium-rare. 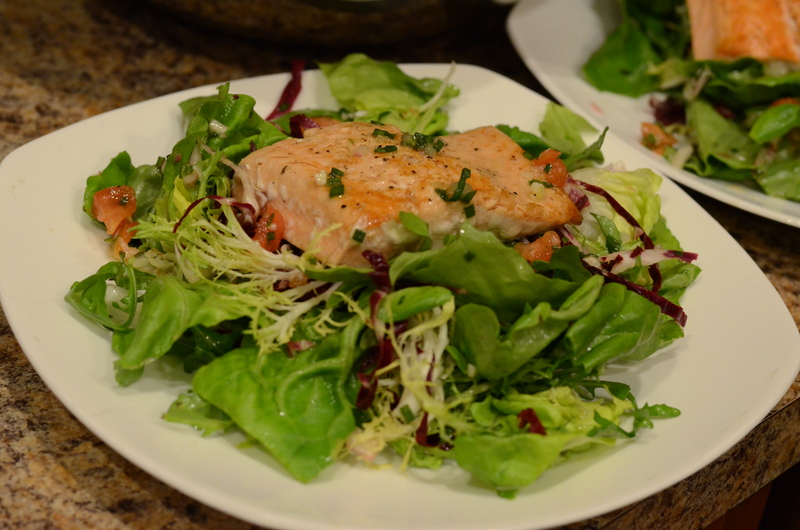 Arrange salad on two plates and place salmon on top. Spoon over some of the reserved dressing. Do you see how much salad this is? The plates would have to be massive to hold all of the salad. My husband joined me for dinner and suffered through some of the bitter elements of the salad. 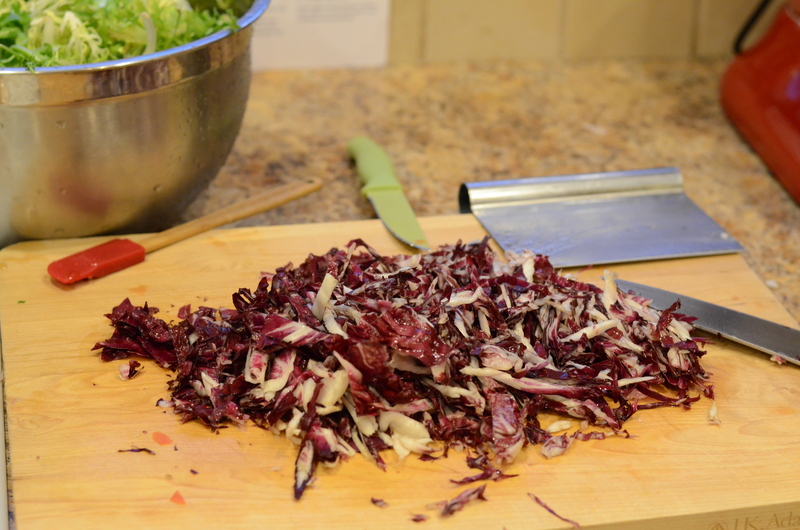 Perhaps this recipe wasn’t the best choice for us because of the salad; I could have done without the frisée myself, since I find its frizzy texture only appropriate in very select dishes, and I already knew the radicchio would be strong. Of course, I could have easily left those parts out. The salad dressing was tasty and paired well with the salmon, but it needed more tomato and could have had more honey or sugar to balance all the bitterness. 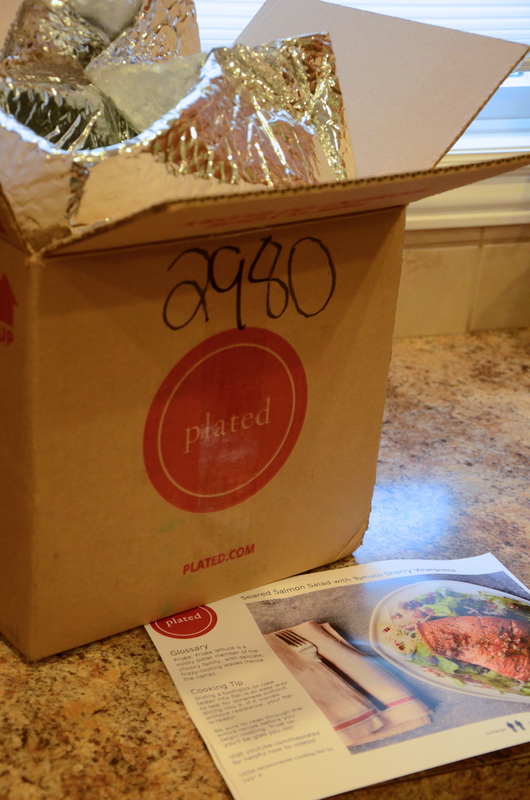 As you may have guessed, I reached a similar conclusion for Plated as I had for Hello Fresh: it may not produce the best results for newbie cooks, or those who tend to follow recipes word-for-word. It certainly doesn’t guarantee proper portions for the selected number of “plates,” which means that people aren’t cutting back as much on food waste as they might think. As long as you keep that in mind, you might enjoy the healthy, high-quality ingredients and the convenience of avoiding a trip to the grocery store. There are some weeks when I hardly cook at all. Last week was one of those weeks. I figure that I generally cook at least three times a week, often four. This week I cooked once. The rest of the nights were dining out and leftovers. There were plenty of leftovers for lunches and snacks, thanks to the huge batch of meatballs that came out of Smitten Kitchen’s lamb meatballs recipe (which used up some pretty old feta cheese). Then Matt brought home the rest of the individual pastrami sandwich he ordered for lunch from Harold’s New York Deli. To get some perspective on the size of their portions, I once took a picture of a single slice of their cake next to a wine bottle, which matched it in length. Too bad I can’t find that photo. It’s as though I’m still in that pre-vacation mode, careful to be realistic about how much time I’ll actually have to cook before the kitchen is abandoned for restaurants or food truck tasting events. As a result, I didn’t have a whole lot prepared when Mother’s Day crept up, and I had the assignment of appetizers for my family gathering. With leftover scallions, ginger, shredded mozzarella and other italian cheeses from home, the provisions of my mom’s pantry, and a dozen and a half button mushrooms, Matt and I cranked out two crowd-pleasing hot apps with little to no shopping, and minimal labor! 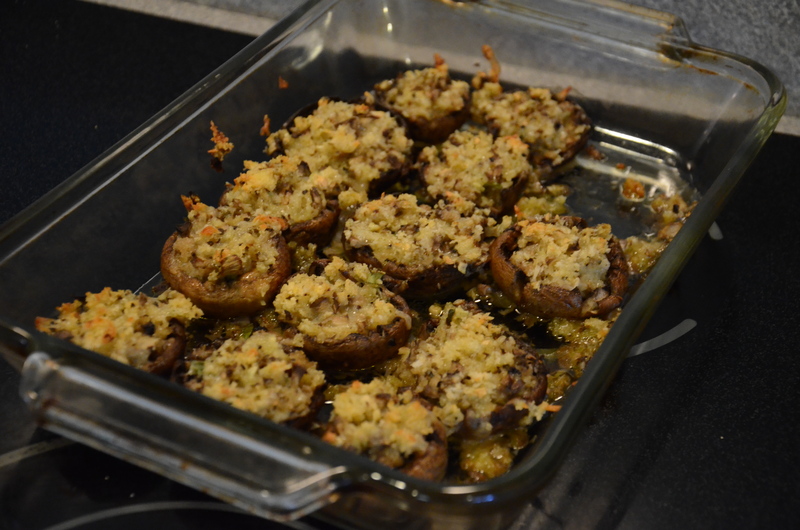 I did a variation on this stuffed mushroom recipe. I will admit that hollowing out the mushrooms is a bit labor-intensive. This is an accomplishment for me, considering that I generally bite off way more than I can chew when it comes to recipes for entertaining. 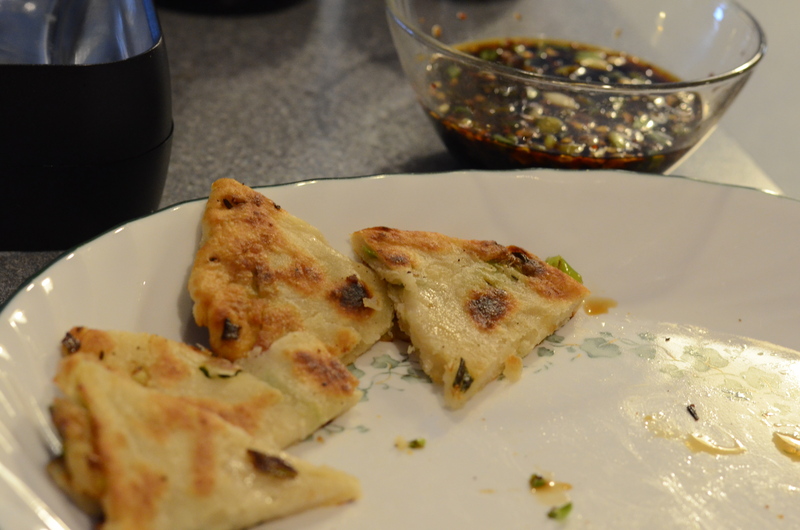 In addition, the first recipe I ever tried (and still use) for scallion pancakes is much more challenging, and has added steps. 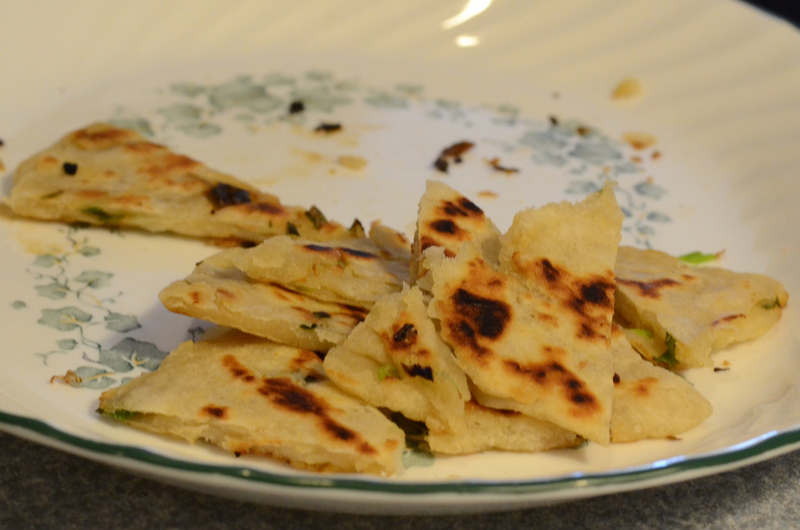 The most difficult part of making scallion pancakes is getting the scallions distributed throughout the dough, and not having them squeeze out everywhere and make a mess. The other recipe I use, an older one from Cooking Light, adds slippery sautéed mushrooms to the mix; those little suckers don’t like to stay in the dough. 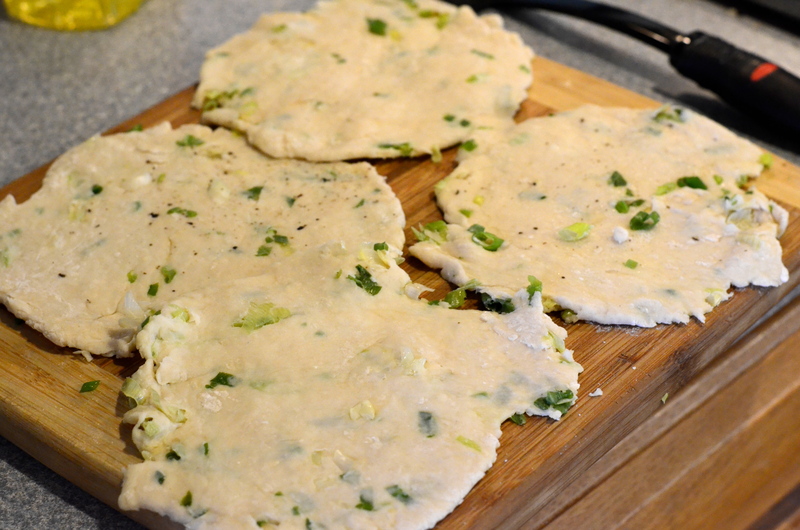 But for a simple Sunday afternoon appetizer, a simplified recipe is the winner. 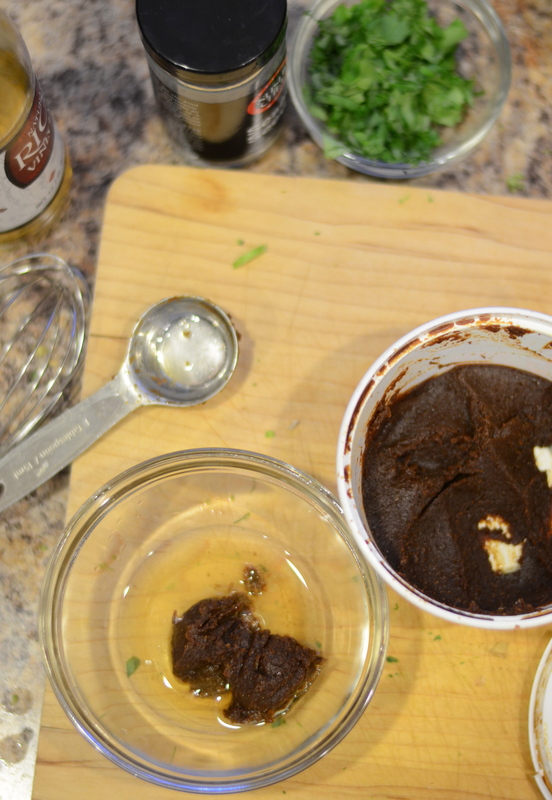 You get most of your flavor from the dipping sauce, and it is much less messy to make. First, prepare the dough, which needs to rest for 30 minutes once made. Sift flour into a bowl or a food processor. Pour the boiling water in at a steady stream while mixing, either with a wooden spoon or spatula or in a food processor. Add water until a ball is formed. 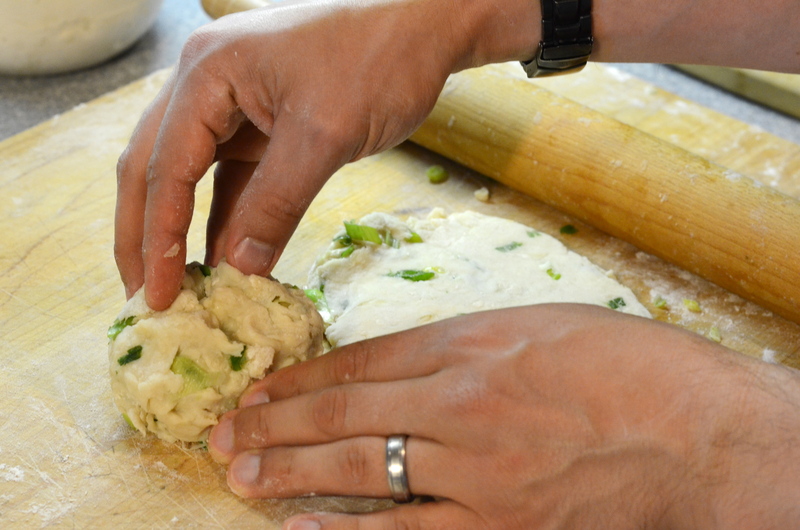 After starting to mix with a spoon, we switched to mixing by hand to get the dough into a ball. 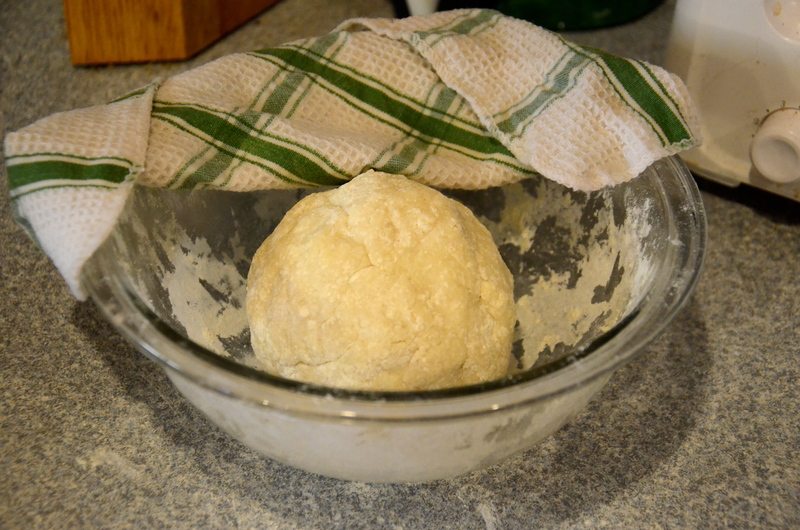 Let dough relax for at least 30 minutes, under a damp towel, while you slice and dice. Prepare the dipping sauce. 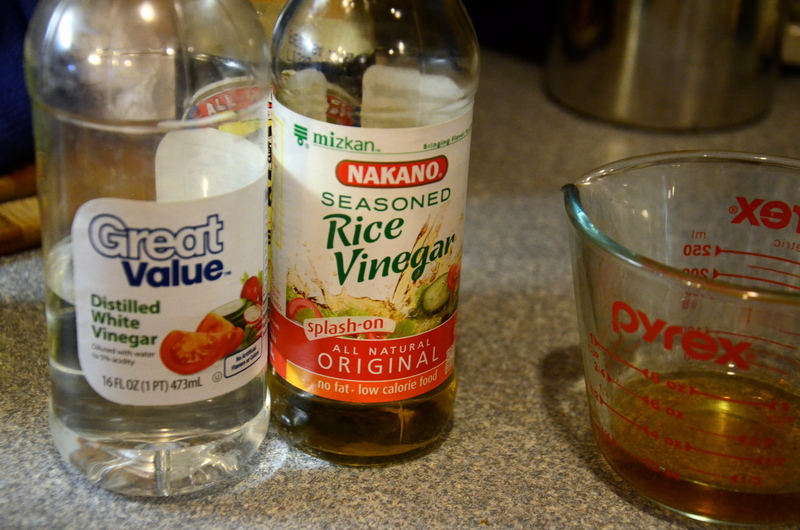 My substitution for Chinese rice vinegar was half seasoned rice vinegar and half regular white vinegar. 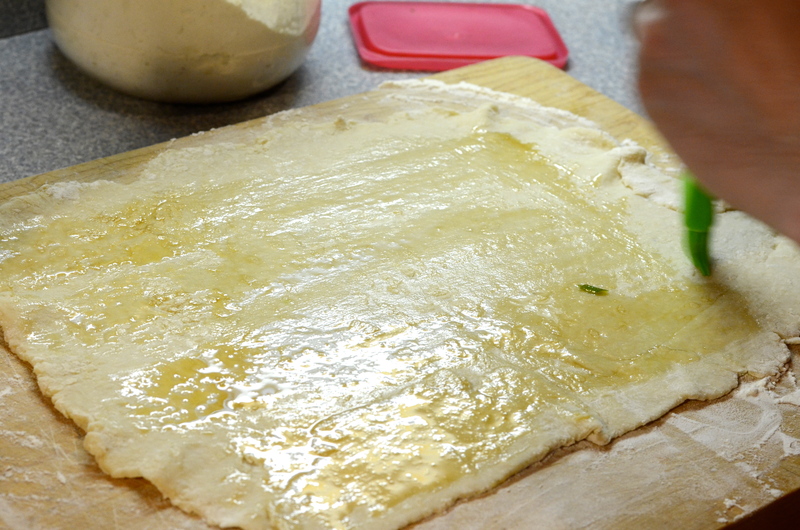 Prepare a lightly floured surface and roll out the dough into a thin rectangle. 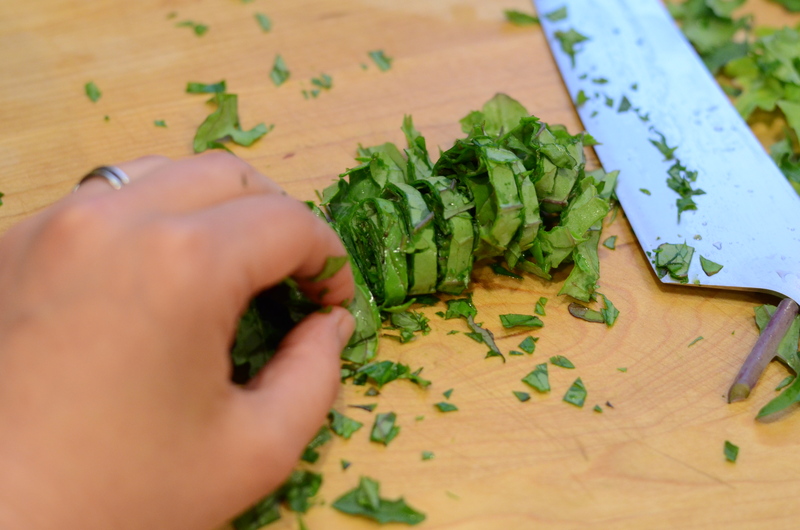 Brush to the edge with sesame oil. 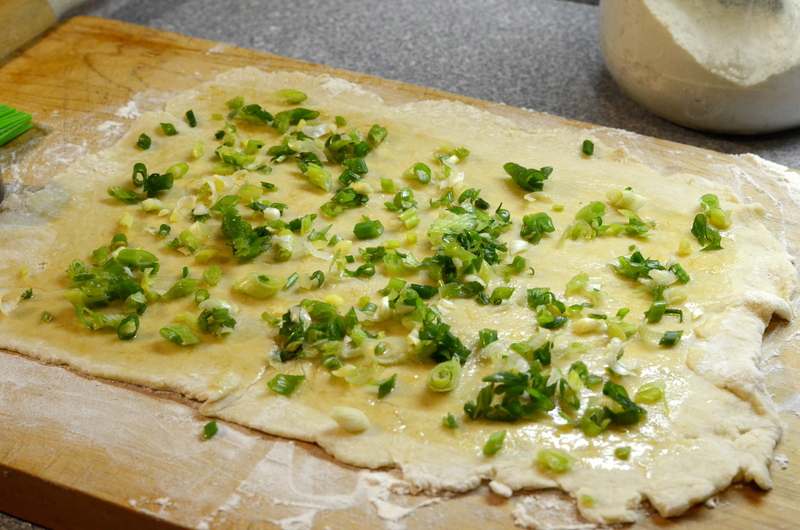 Sprinkle evenly with scallions. Leave a little bit of room around the edges. Season with salt and pepper. Roll from the long side like a sponge cake. 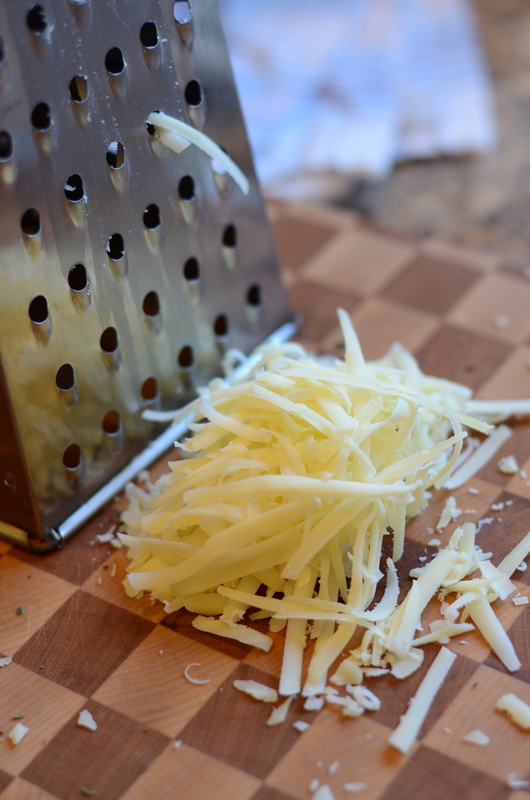 Cut with a knife into 4 pieces. Take one of the four pieces and gently twist three times, like a Tootsie roll wrapper. As you are doing this, it should stretch the piece a bit lengthwise. Take that snake and make a spiral, like a lollipop. This definitely doesn’t look like a lollipop. Do what you can-it doesn’t have to look good at this stage! Take a rolling pin to this circle and flatten into a 5 to 6 inch pancake. Repeat. The pancakes are then basically fried in canola oil. 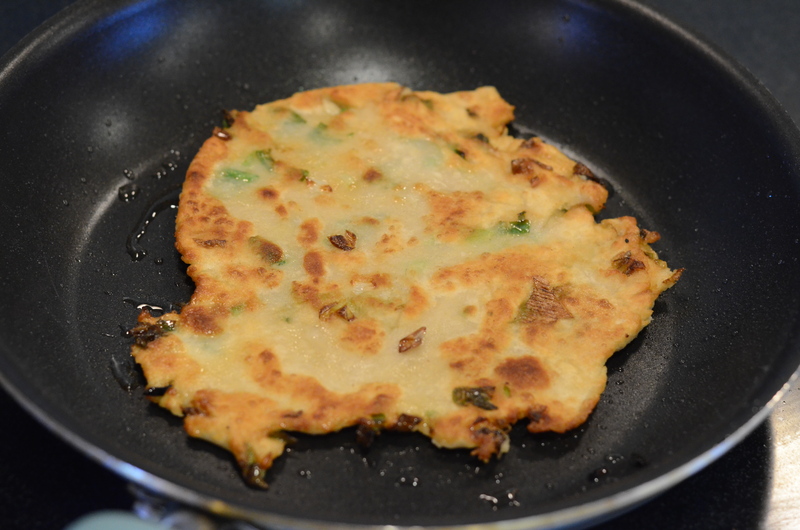 If you have a larger nonstick pan, you can do more than one at a time. 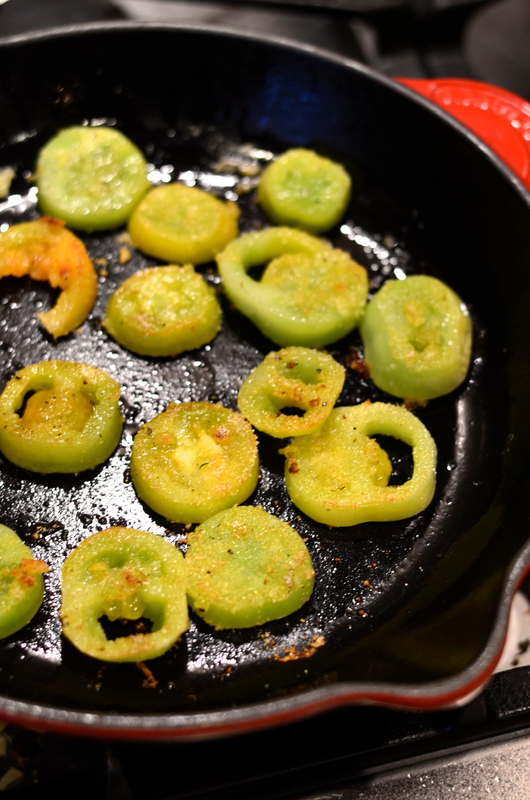 With a smaller pan, I fried one at a time, adding canola oil as I went. You need a good coating of canola oil in the pan to get a golden brown. 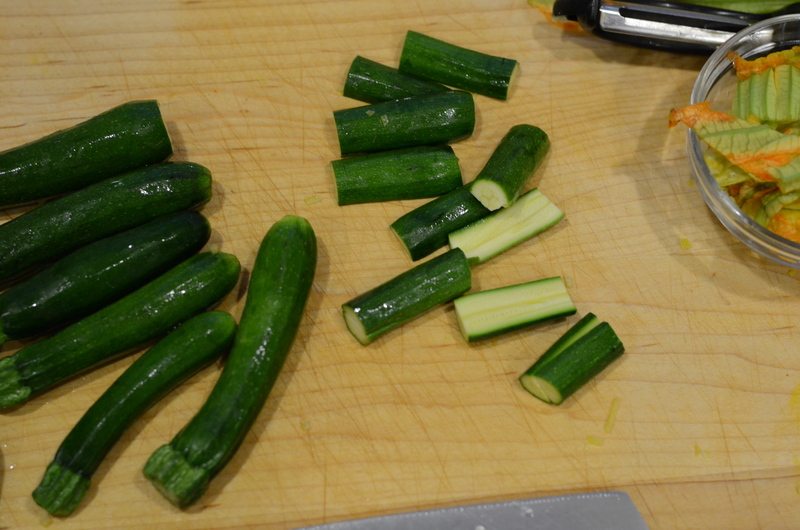 Cut into wedges (I prefer using kitchen shears) and serve immediately with dipping sauce. They will be gone before you know it! The whole spring-forward-daylight-savings-thing is a killer. In spite of the fact I tried to go to bed early last Saturday night, I was dragging every morning thereafter. My distaste was only slightly dampened by noticing sunlight later in the evenings. If only there was a way to experience the thrill of extra daylight without losing sleep. Can’t the clock switch from 4:00 to 5:00 pm on a Monday? I really didn’t feel like cooking when I got home from the gym last Tuesday evening. I was tempted to make my dinner out of a mishmash of snacks and cheese; maybe I’d go as far as to open some boxed pasta or a can of beans. The fact that I had fresh fish in the refrigerator, waiting to be cooked, meant I needed to overcome these impulses. I’m glad I sucked it up. 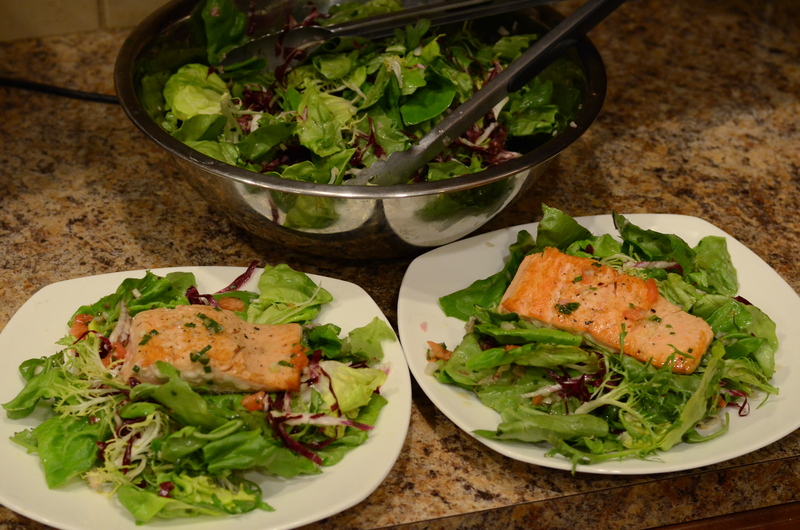 It doesn’t take long to put together a fresh, complete weeknight meal like this, getting in my omega 3s and vitamins. 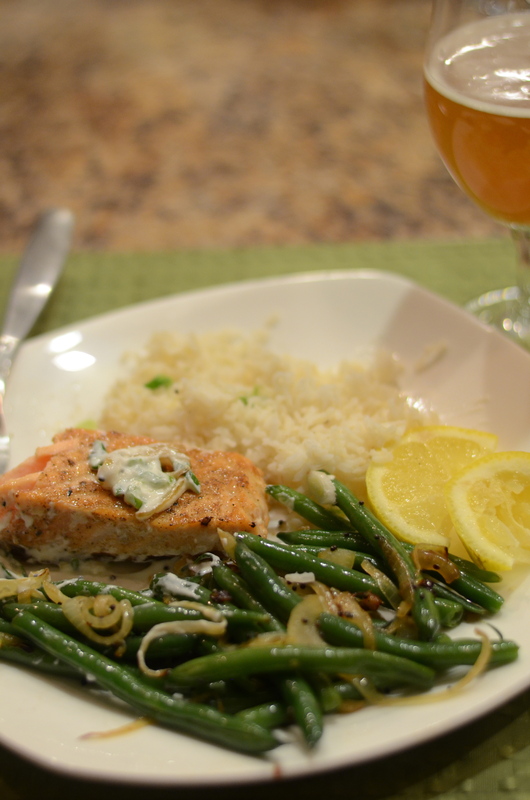 Green beans and salmon cook quickly (especially with subjective measures of done-ness, so you can be even quicker if you want) and rice is hands off. I only had to chop 3 small things and measure a couple of others. Easy breezy! The spice seasoning for the fish is garam masala. I have been making garam masala by toasting fresh whole spices at home, and one of the last times I made it, I made a pretty large batch. 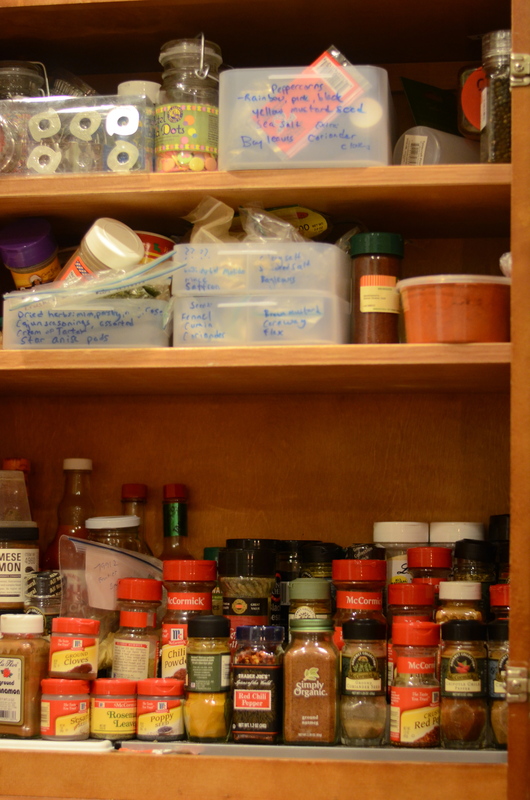 While we’re on the topic of spices, I have a reason to mention my spice cabinet organization. 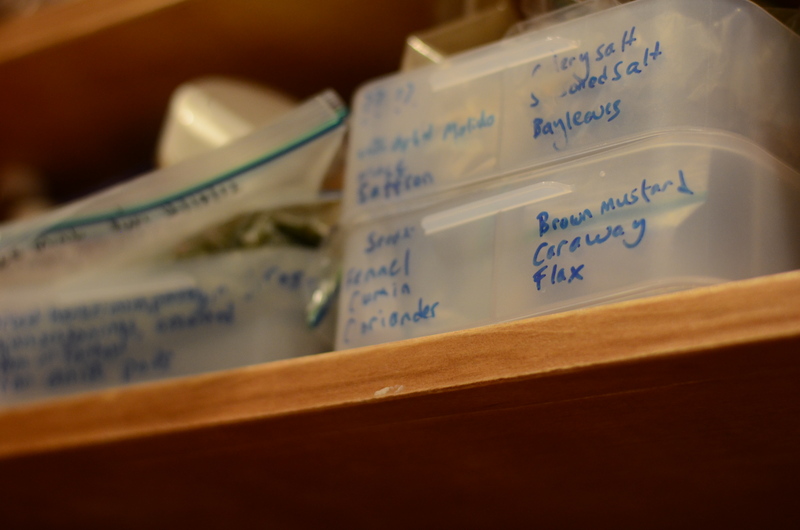 As you can imagine, it can be hard to keep track of a dozen little by-the-ounce plastic baggies of spices. Occasionally I relocate them to other empty spice containers, but they take less space in the bag. I found stackable plastic flat containers at the Container Store which have 6 shallow compartments. I can arrange several spices front to back in the compartments. Then I label the front with dry erase marker with each item in order. This way, I can see what I have with a quick glance, and I’m maximizing the space. Back to the cooking! 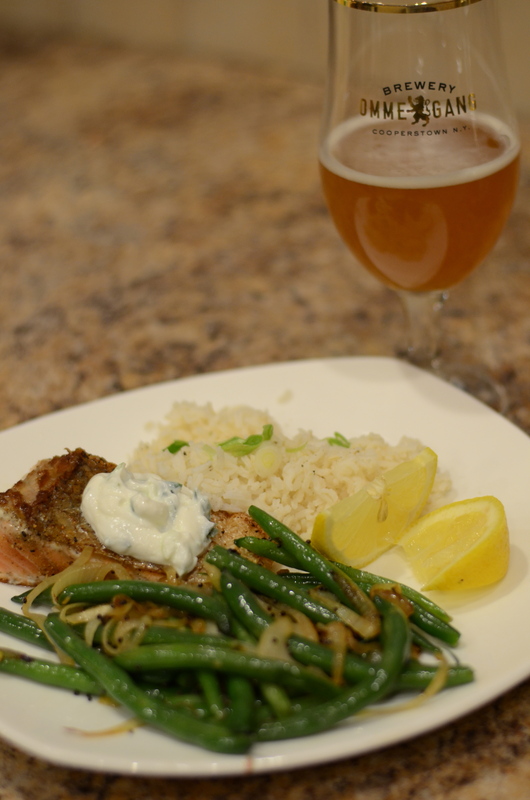 A note on timing and temperature: the steps to this meal include boiling some basmati rice, blanching the green beans, sautéing the green beans, and pan-roasting the fish. My husband will tell you, I have a “thing” about my food being served at the proper temperature (and I pay close attention to this at restaurants). That usually takes the form of me wanting hot food to be served noticeably hot. 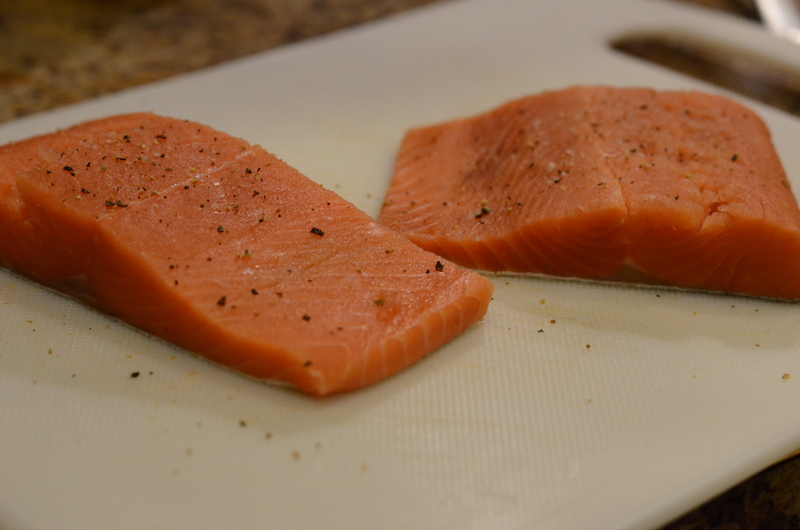 You’re going to want to eat your salmon freshly cooked, so it should be the last thing you finish, obviously. I wanted to minimize dirty dishes, so, while the rice was cooking, I blanched the green beans and then sautéed them first in the same pan I planned to use for the salmon. While the salmon was finishing up later, I gave the beans a quick reheat in the emptied blanching pot. Then everything got cold as I was taking pictures, of course. 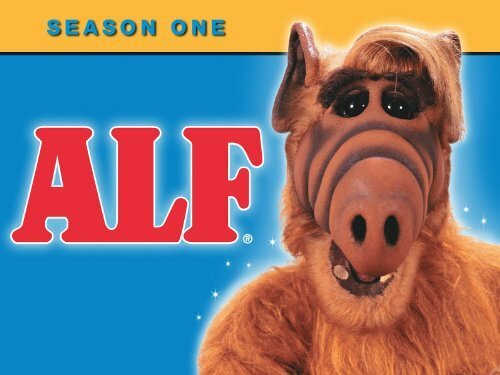 No one ever mentions that! Heat a large skillet over medium-high heat. Add 2 teaspoons oil to pan; swirl to coat. 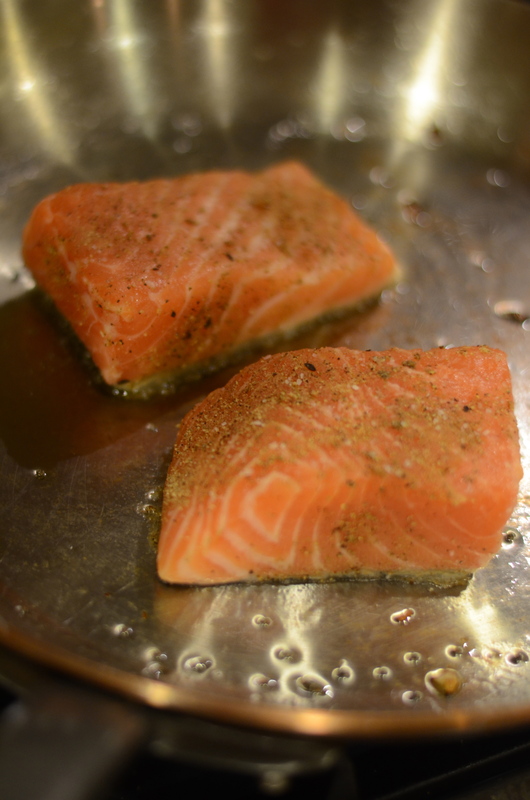 Sprinkle fillets evenly with garam masala and 1/2 teaspoon salt. 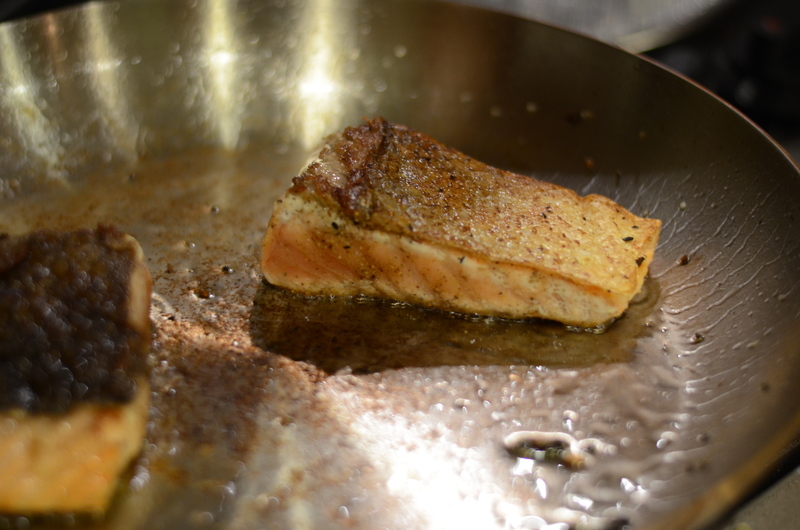 Add fillets to pan, skin side down. Cook about 7 minutes; turn over, and cook 1-2 minutes or until desired degree of done-ness and temperature. 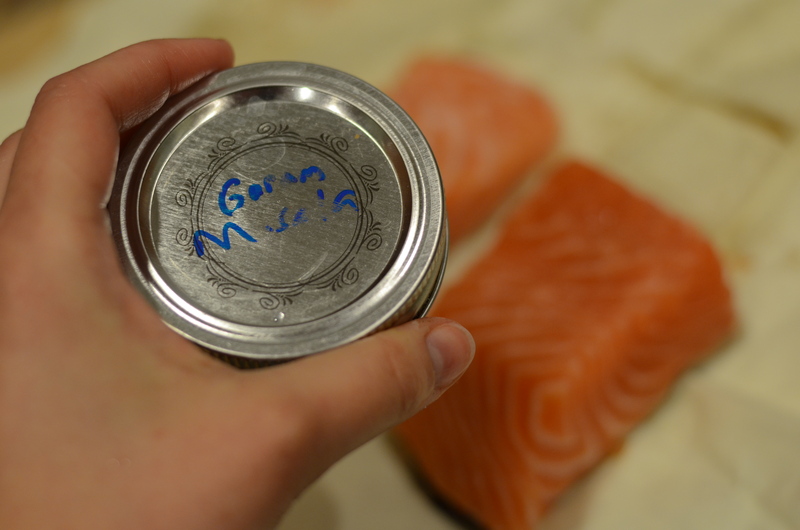 While the salmon is cooking, combine ingredients for the sauce. Whisk 2 1/2 teaspoons oil, 1/8 teaspoon salt, yogurt, green onions, and lime juice in a small bowl. 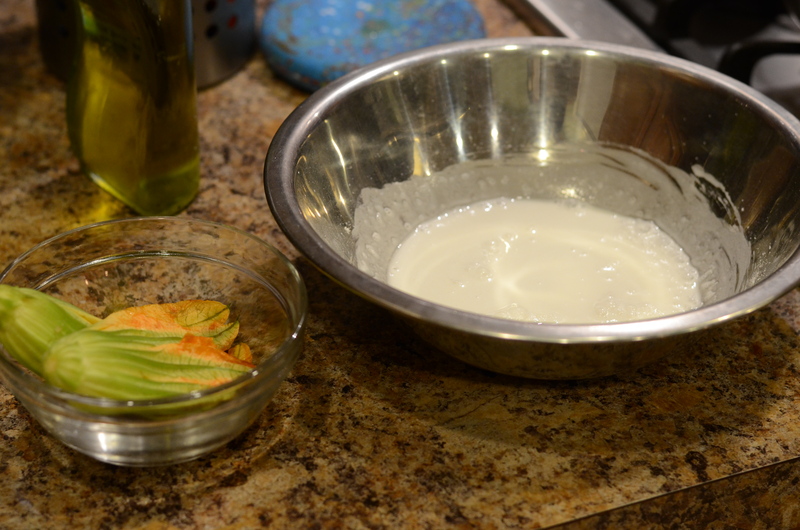 The original recipe called for a combination of creme fraiche or sour cream and yogurt for the sauce. I only had Greek yogurt, which is my go-to substitute for creme fraiche and sour cream anyway, so I used the yogurt alone. It still tasted great to me. Dollop mixture onto fillets, when serving, along with lemon wedges on the side. Remember, you can keep your fresh ginger in the freezer to make it last so much longer! Bring a pot of water to a boil. Fill a large bowl with ice and water. 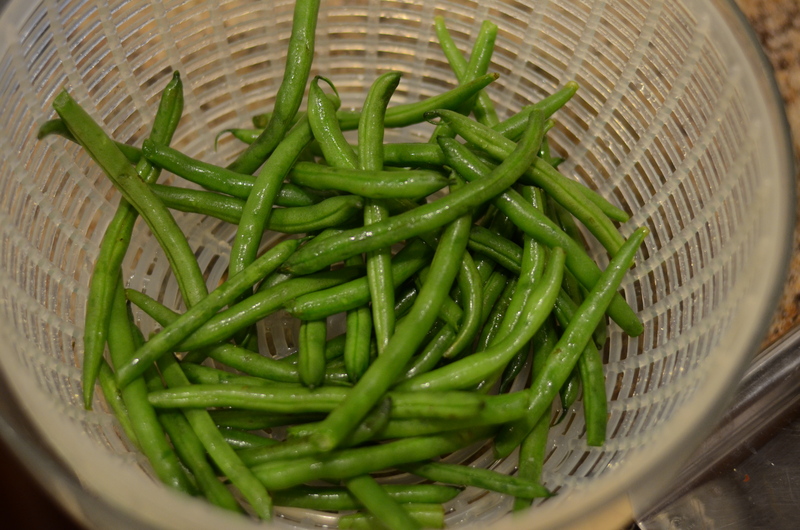 Once water is boiling, add 1 teaspoon salt and string beans. Cook about 3 minutes (the beans should turn bright green), and drain into a colander. Transfer to ice bath and slosh the beans around. Drain again. Set the large skillet over high heat, and add vegetable oil. 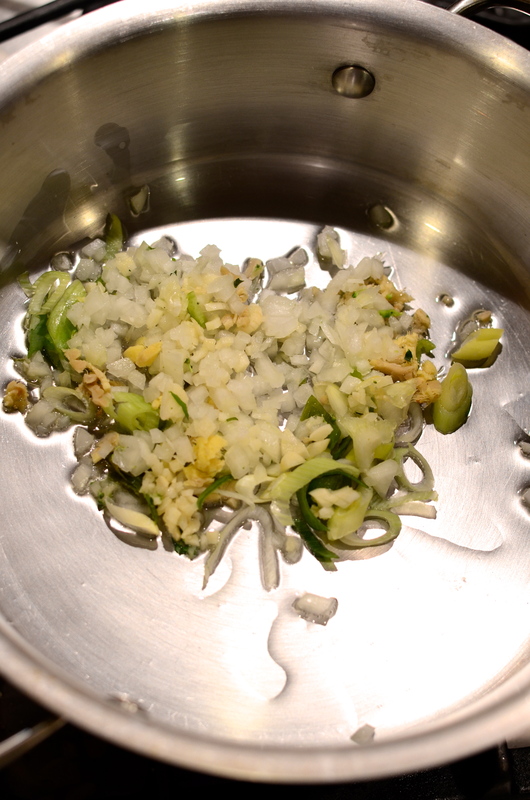 When hot, add mustard seeds, and cook about 30 seconds, until seeds start to pop. 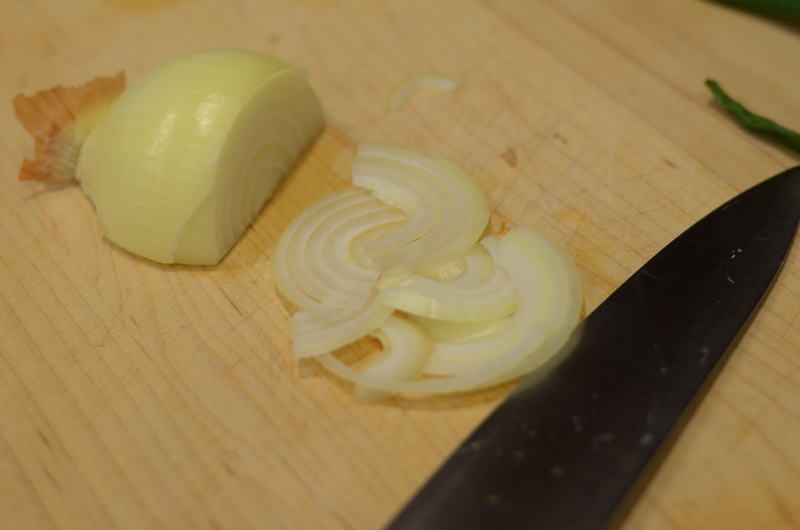 Add onion, and cook, stirring until they begin to brown, 3 to 4 minutes. Add ginger, and cook 1 minute more. 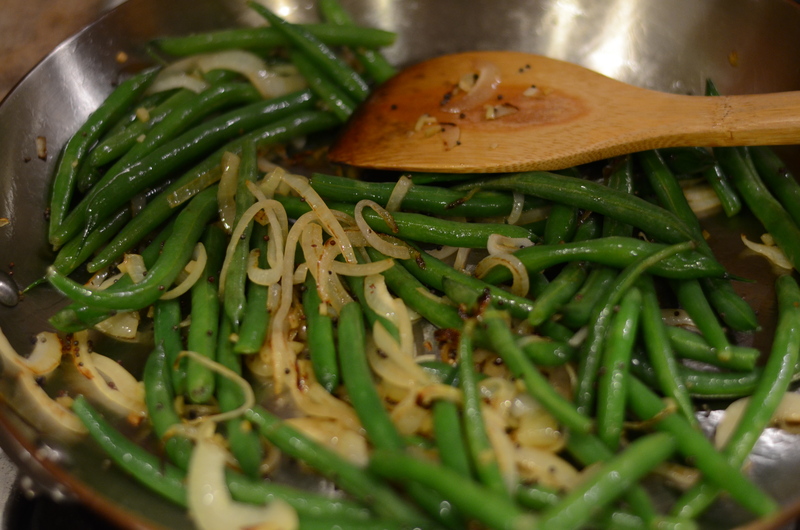 Add reserved string beans, and cook, stirring until hot. Season with salt to taste. Dinner is served! I realized later that my salmon was incorrectly placed here with the skin side up.